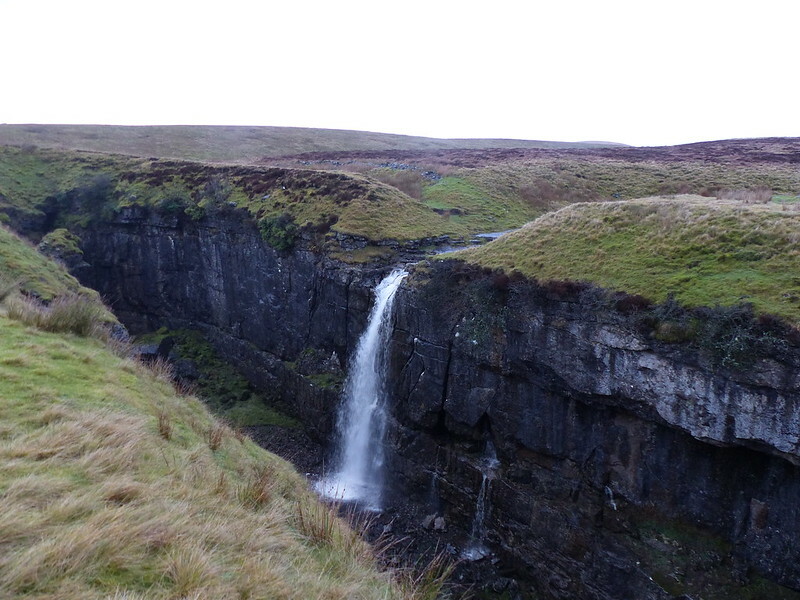 Pre-Xmas Weekend: Ling Gill and Calf Holes. The forecast for the Sunday was, if anything, even worse than it had been for the day before. 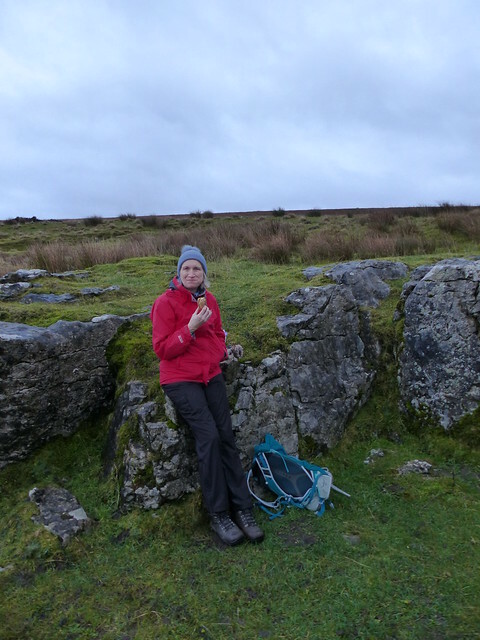 However, some of us were itching to get out, and so, when TBH revealed that she had left her trekking poles behind whilst out on a walk the day before, we decided to go out to look for them. 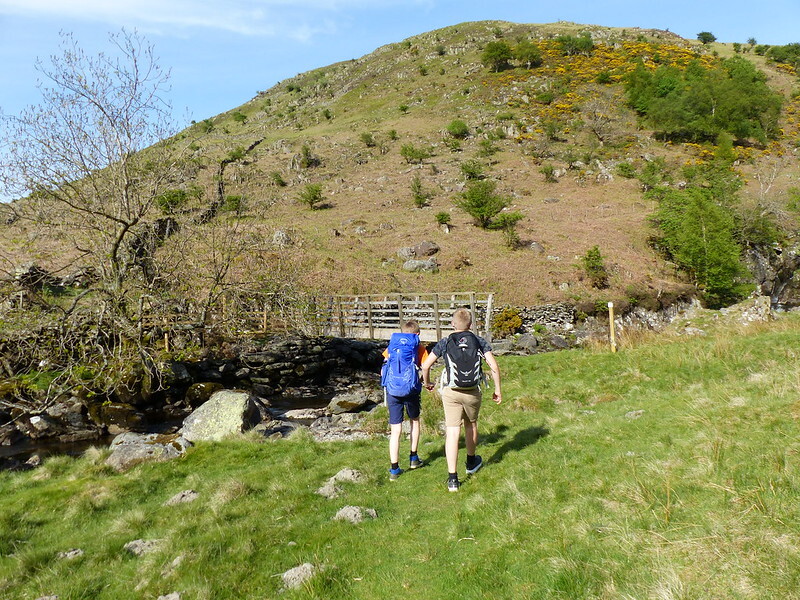 We started by heading up onto the moors of Cam End then turned south on the Pennine Way, heading for the impressive gorge of Ling Gill. We met a lady walking her dog who told us that she walks that path every day and that we were the first people she had met for months. It’s a very quiet corner of the world! 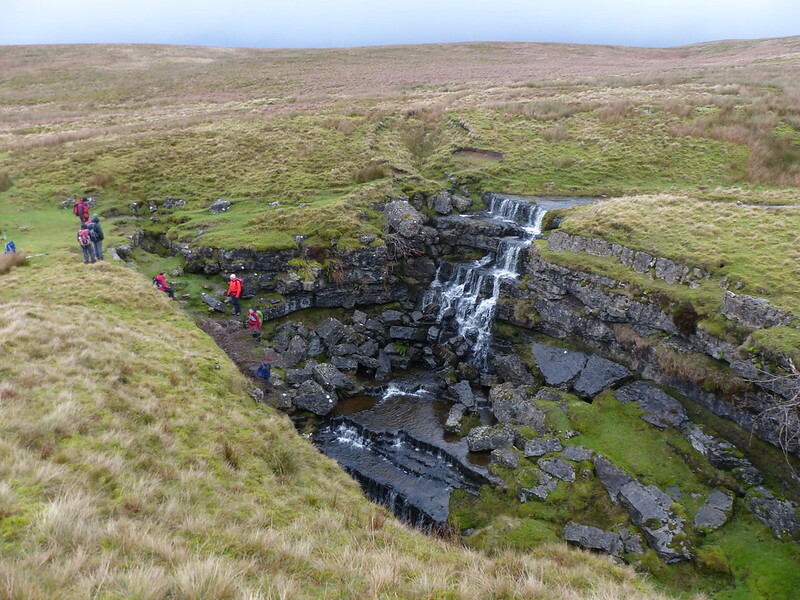 Looking across Ling Gill to Ingleborough. 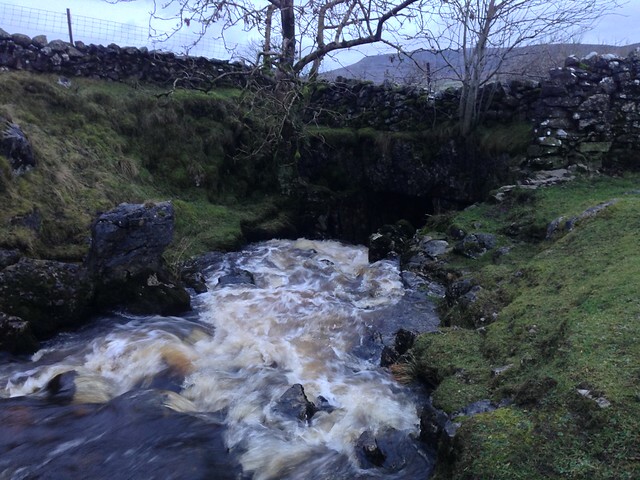 At Calf Holes a stream disappears into a yawning pothole. TBH had been here with the boys the day before and this was where she thought she had left her poles. There was no sign of them, but it later transpired that some of our friends had picked them up here later in the day, so she will eventually get them back. TBH wasn’t overly concerned about her poles and, whilst Andy and I faffed about taking photos, took the opportunity to tuck in to her pack-up. 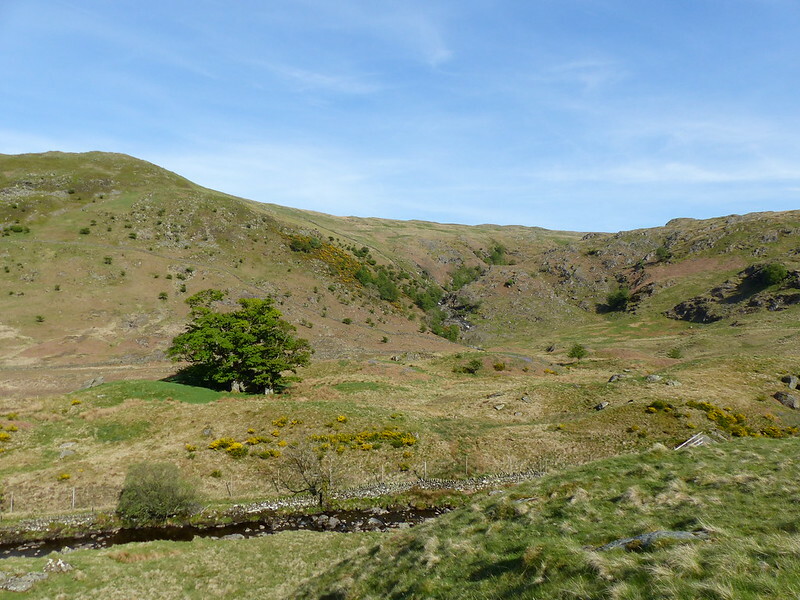 The stream which pours into Calf Holes emerges downstream at Brow Gill Cave and then flows briefly underground again at God’s Bridge. We’d been this same way on our previous outing, but that had been in the dark, this time we managed to get back to the lodge almost before it got completely dark. 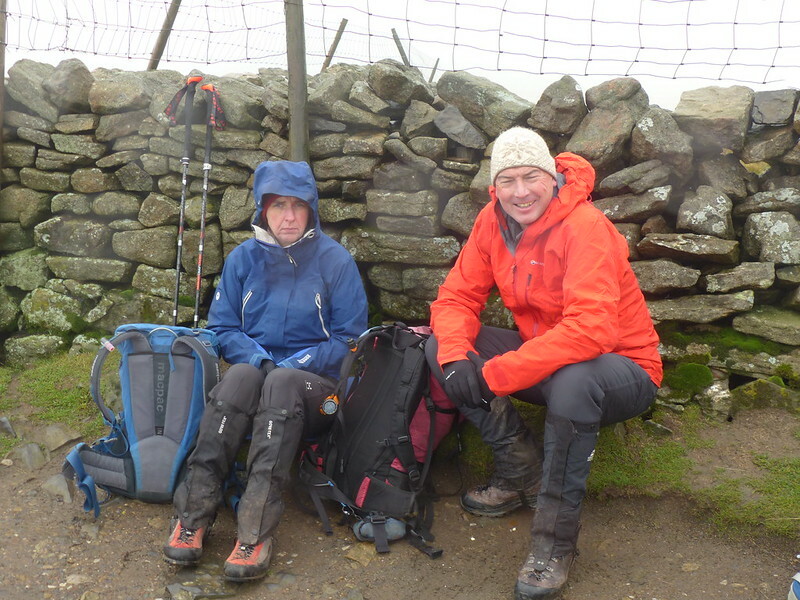 In the end, the weather had been much kinder than we had been led to expect with hardly any rain and not too much wind – it had been a good decision to get out. The next day, when we were packing up and leaving, the sky was pure blue, the sun shone and we were too busy to take advantage of it. Not to worry, it had been a highly enjoyable weekend, as always and a great start to our yuletide celebrations. I’ll take a moment to say that, if you are after simple, comfortable and spacious accommodation in a fantastic location for a largish group at a good price, then this place is going to be very hard to beat. 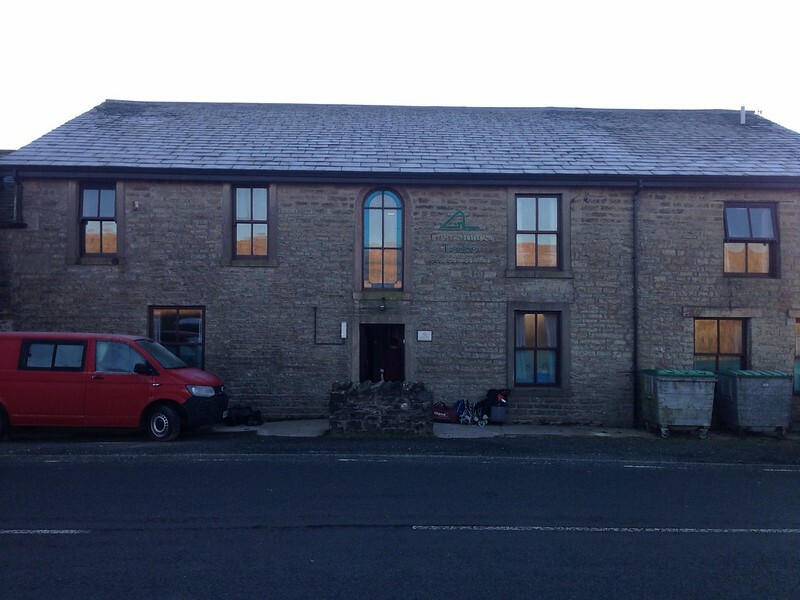 The first time we booked accommodation for a weekend before Christmas, A was just a baby and spent most of the weekend happily rocking furiously or sleeping in the only warm room at Slaidburn hostel. Now here she is, in the first photo, practically all grown up. 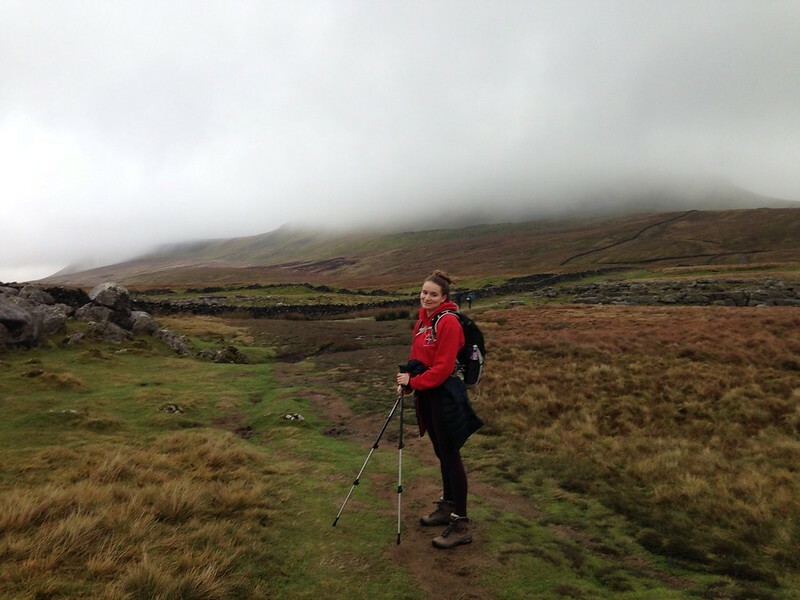 It’s not the best photo of either A or Pen-y-ghent, which is hidden in the cloud behind, but I’ve included because it’s a very typical A pose: she doesn’t want me to take her photo, but is tolerating my antics with a bemused look which tells me just how little she appreciates it. Here she is again. 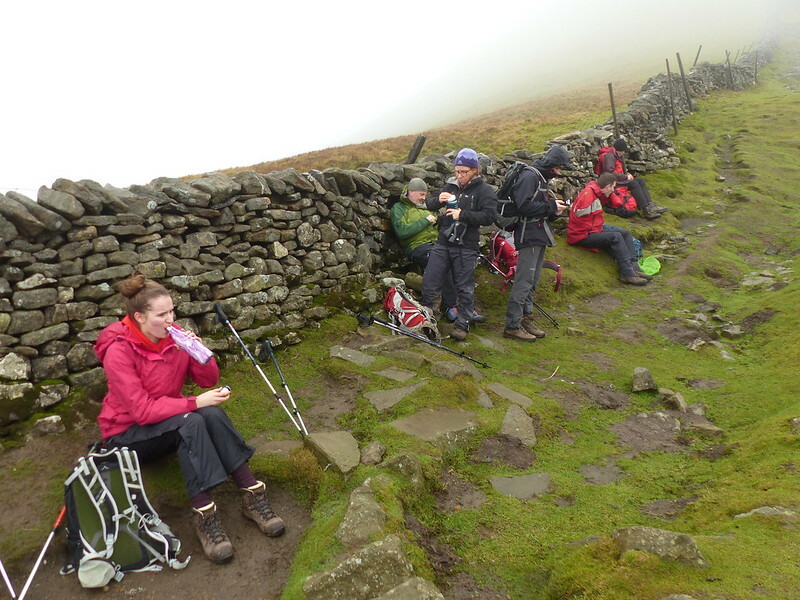 We were all hunkered down behind the wall seeking some shelter from the wind and rain. We’d parked in Horton-in-Ribblesdale and were climbing Pen-y-ghent with the intention of continuing back to Gearstones afterwards. Around the opening of Hunt Pot. 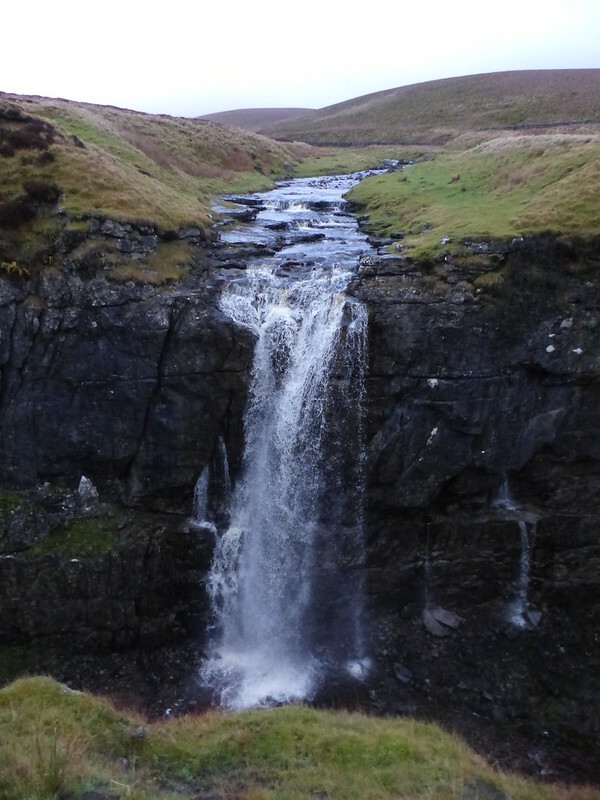 Usually, the streambed above the pot is dry, but one compensation of the weather being so wet was the opportunity it afforded to see the falls cascading over the edge of the pot. And that’s it for my photos of that day. We still had quite a long way to walk, but it was very overcast at first, then dark for the last hour or so and anyway, I was busy chinwagging. The ground we covered from Pen-y-ghent back to Gearstones did look very interesting, when we could still see it, and I look forward to going back to have another look in more conducive conditions. 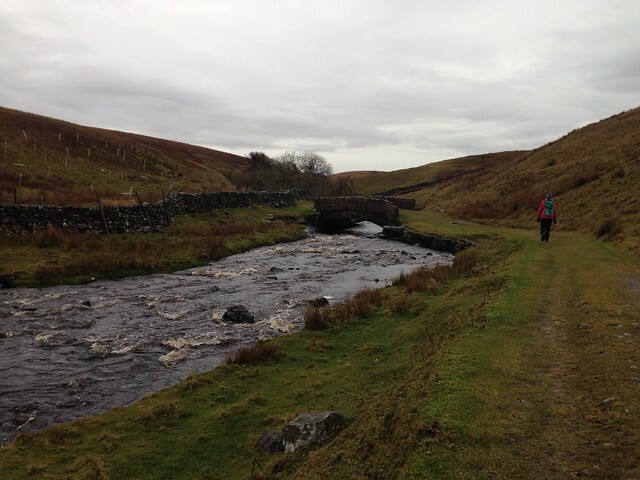 Andy has helpfully included a map of our route in his post and there are more photos too. 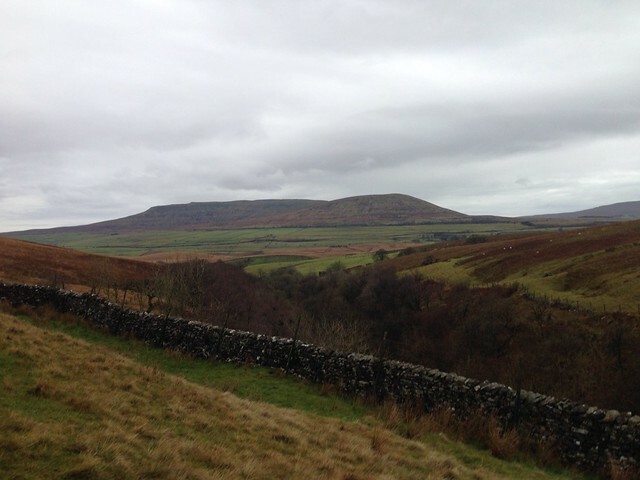 And for photos from Pen-y-ghent in better weather, here are two previous posts of my own: here and here. Back at the hostel, we dried out over cups of tea then enjoyed some top-notch grub and no doubt lots of silly anecdotes. ‘It Might Get Dark’ by White Denim, which has something of Marc Bolan about it. I’ve heard White Denim quite a bit since I started listening to Radio 6. 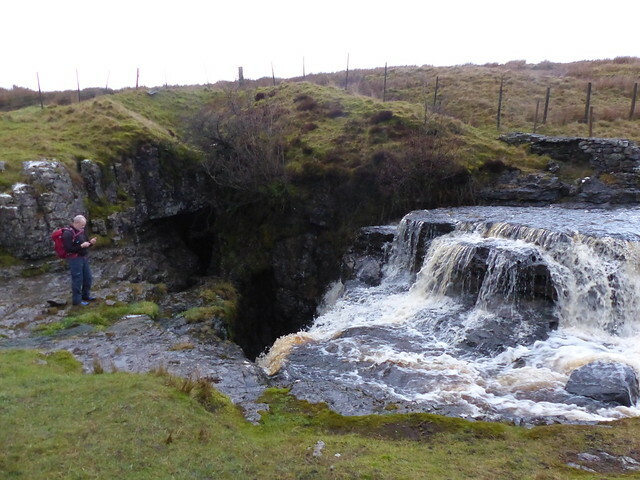 They’re touring the UK in February…..
High Dam and Thornton Force. 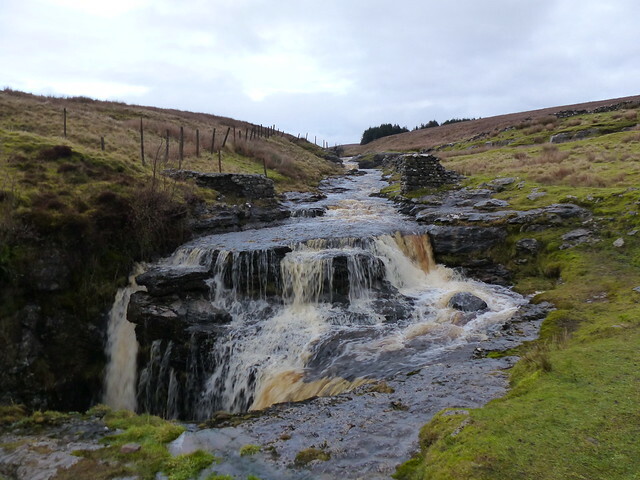 We didn’t visit High Dam and Thornton Force in the same trip, but on two consecutive days over half-term. The Wednesday was overcast, but still warm and sticky and the boys and I decided to check out High Dam. 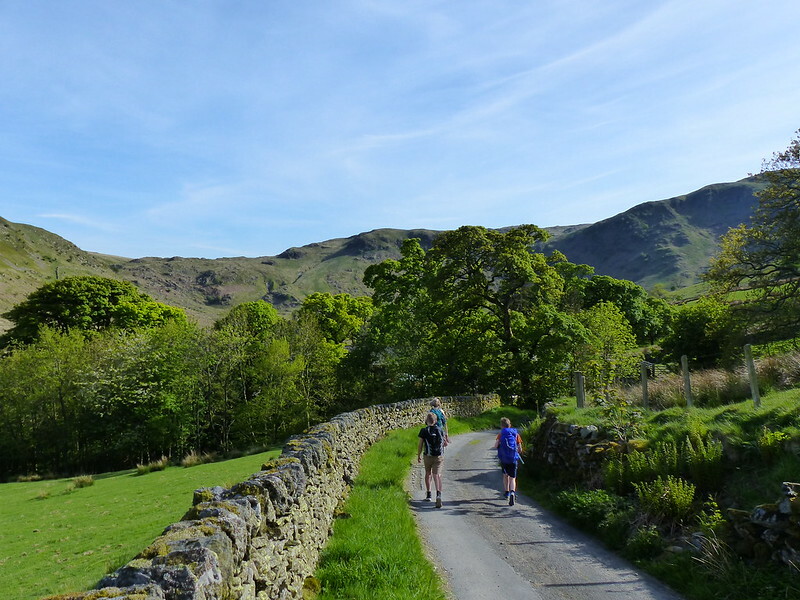 It’s above the southern end of Windermere near Finsthwaite. …but don’t worry, it’s not drinking water. 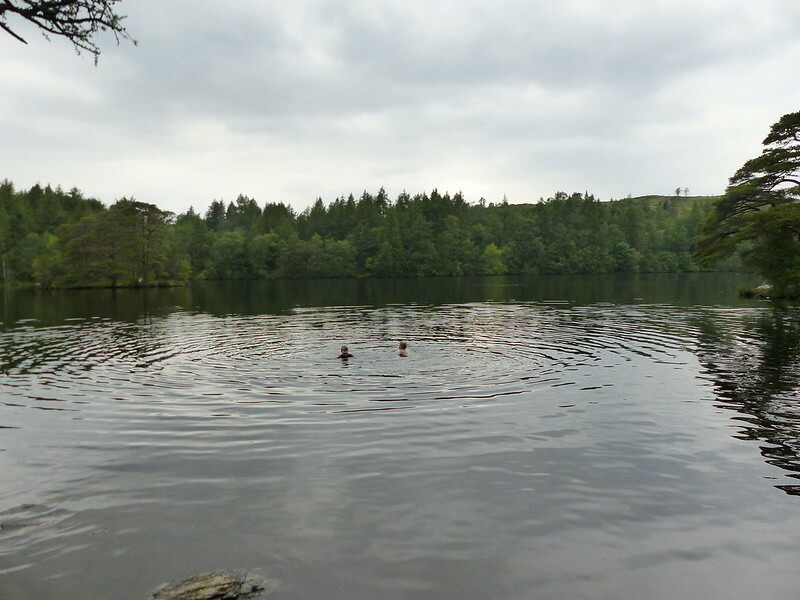 The water is relatively shallow (but deep enough to swim in), peaty, and was surprisingly warm – in other words: not freezing. 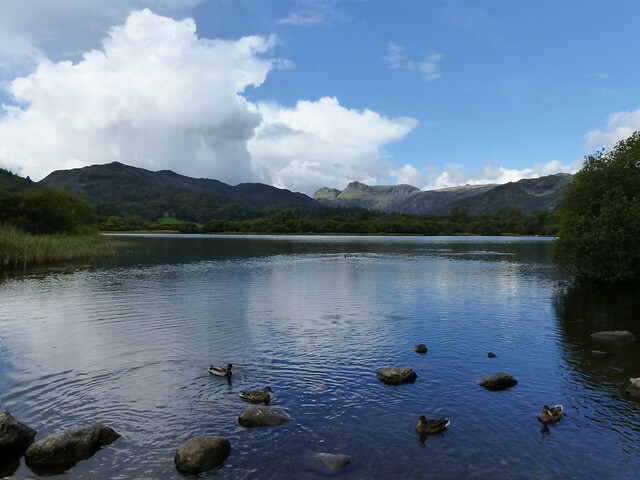 …and swam across to visit the two little islands. On the second a fallen tree, laying out over the water, gave the boys a chance to jump in, which seems to be essential. We swam back, and then back across again, by which time Little S was worn out. So we swam to the southern shore exiting close to the western end of the dam (which looks further on the map than back across the lake would have been, but Little S was happy with it). Having said the water was warm, I should perhaps qualify that admitting that Little S’s fingers were a bit blue by the time we got out of the water. As well as being a bit muggy, it was a windless day and I had been surprised that we weren’t attacked by midges when were changing to get in the water. We weren’t so lucky when we were changing back again. Overall, though a great place to swim, which is not too far from home. 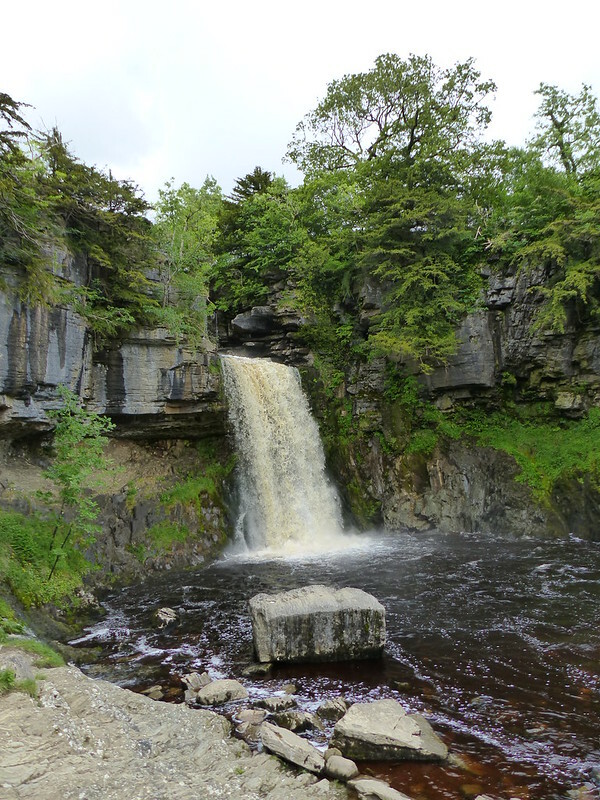 …this is Thornton Force, on the River Twiss above Ingleton. My cousin R is lucky enough to own a house nearby and generous enough to invite us to visit during half-term. The invite was an open one, but since his sister, my cousin K, was also visiting with her family on the Thursday we decided to crash their family get together. It was great to see them again. Eventually, we let him have his way. 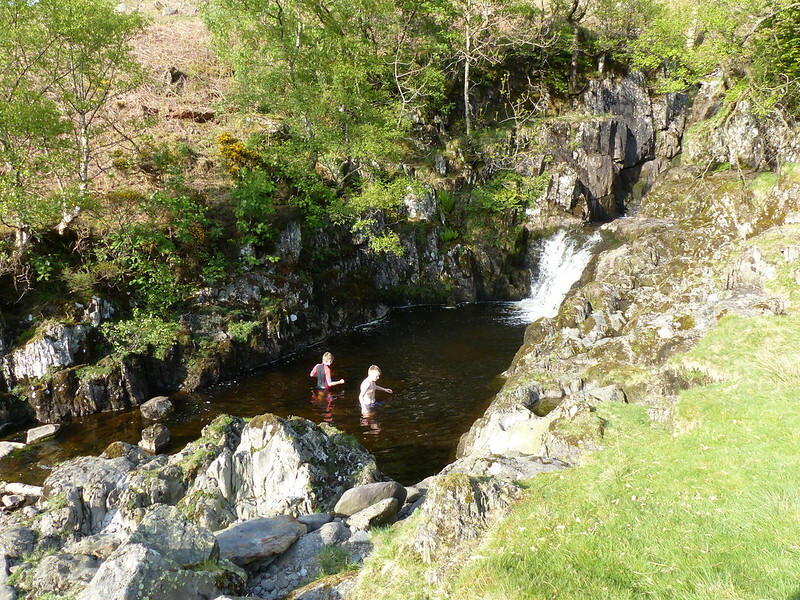 The pool below the force turned out to be of a good size and ideal for swimming. The photo was taken when I visited one evening last summer. It was much, much busier this time. But we were the only ones swimming and the falls had a lot less water coming over them so that we could duck our heads into them, which was very bracing. I entrusted TBH with the camera, but she took lots of close-ups of peoples heads – all very well, but not really showing where we were swimming. Those are both swimming spots we will visit again, I’m sure. An exchange of text messages and phone-calls with TBH during my walk on the Helm gave some shape to the rest of our day. We would have a barbecue at some point, and either take the boats out or maybe look for a gill to play in. You can see that we chose the second option. I also decided to cook at lunchtime so that we didn’t have to rush home in the afternoon. Hardly surprisingly, this turned into a very leisurely affair and wasn’t very conducive for an early departure, but not to worry: we arrived as most people would be leaving and the sun was still shining. …since it gave them a chance to crawl through this culvert, which was practically dry after a couple of weeks with little rain. 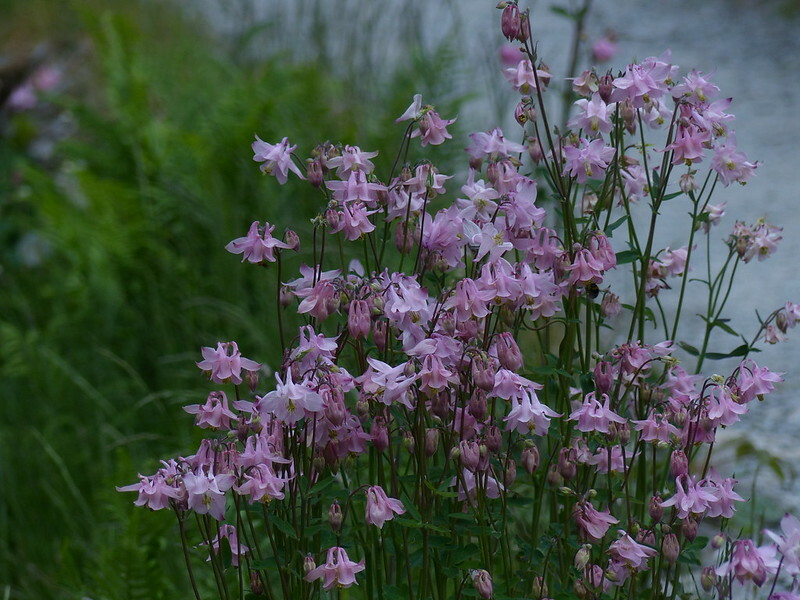 …because Conrad recently posted pictures – subconsciously, that’s probably what put Swindale in my mind when I was trying to think of stream with falls and pools and an east facing aspect to catch some late sun. 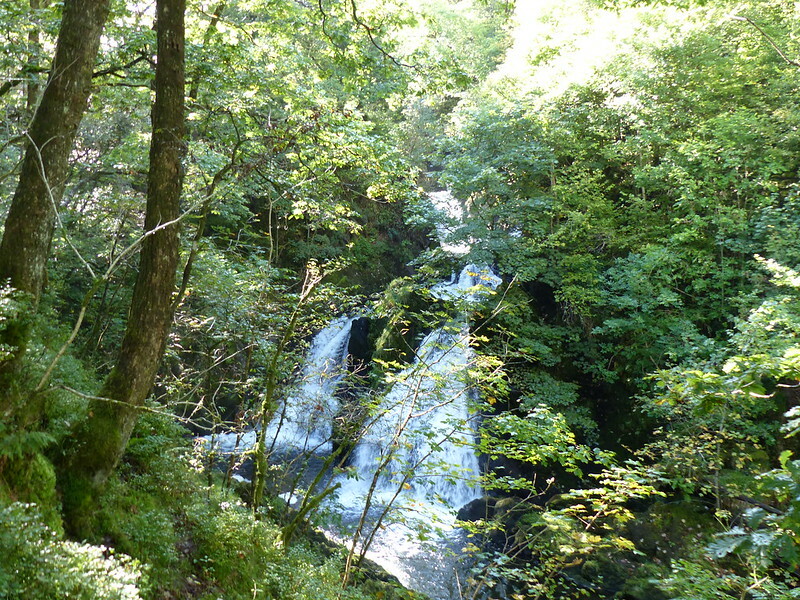 The fish-ladder is part of a joint venture between the RSPB and United Utilities. They’ve also put the meanders back into a part of the stream which was straightened some time ago. I assumed that the fisher ladder was intended to benefit Salmon, but it’s won an award from an organisation dedicated to Trout, and there seemed to be a device for counting Eels too, which shows the limit of my knowledge about fish. 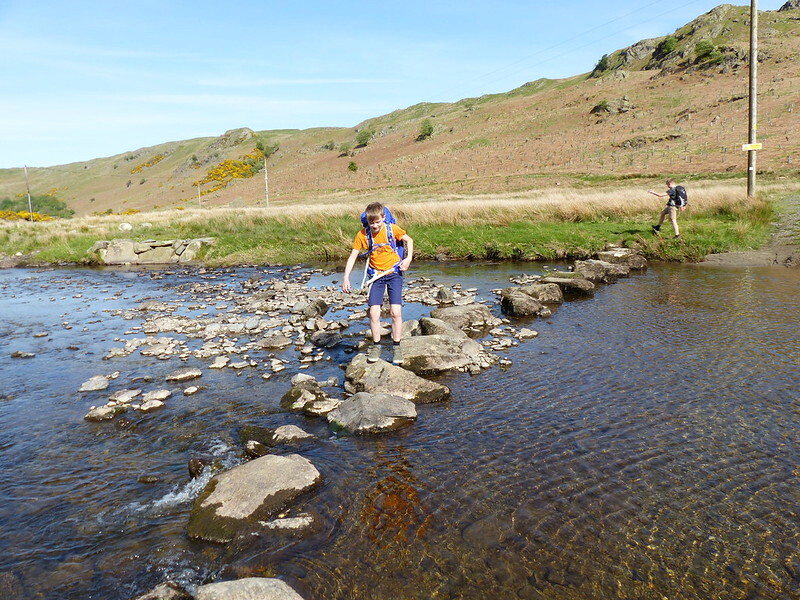 …but who can resist stepping stones? Which was very quiet and pleasant walking. 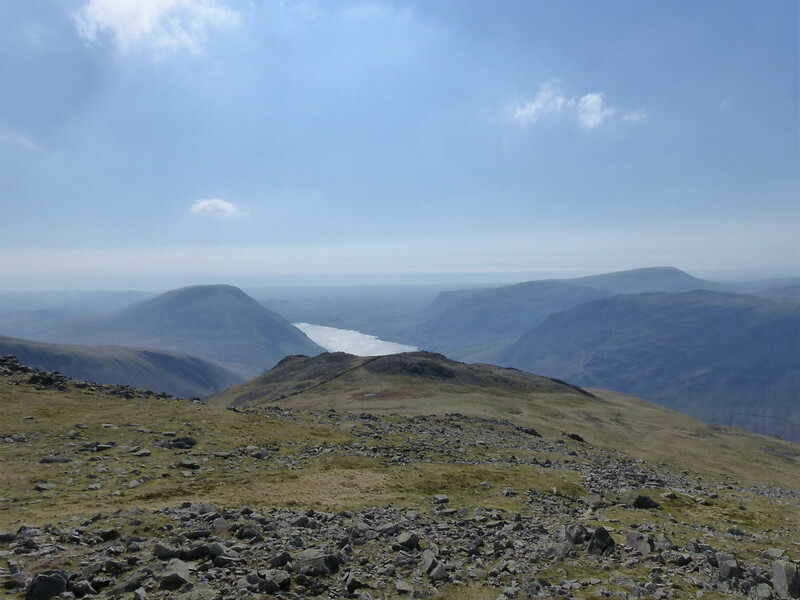 Hobgrumble Gill and Dodd Bottom. 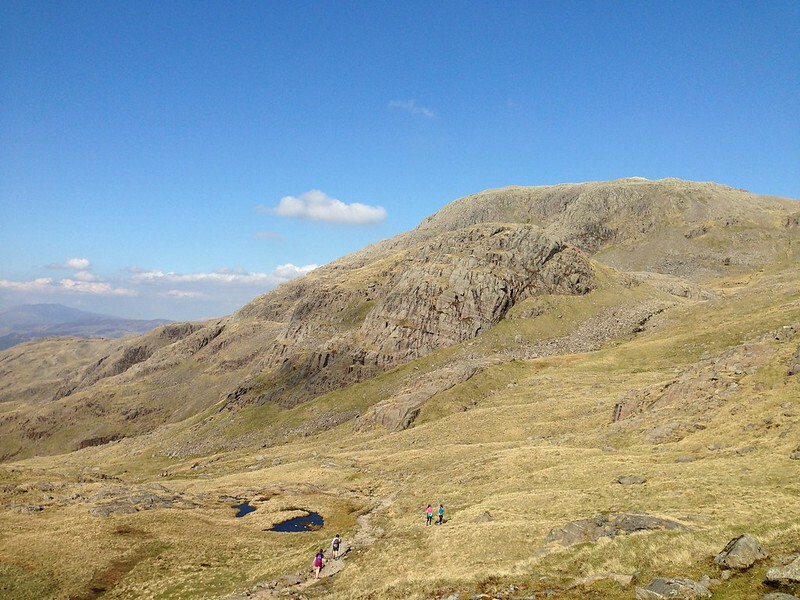 Dodd Bottom is pancake flat and must surely once have been a tarn? 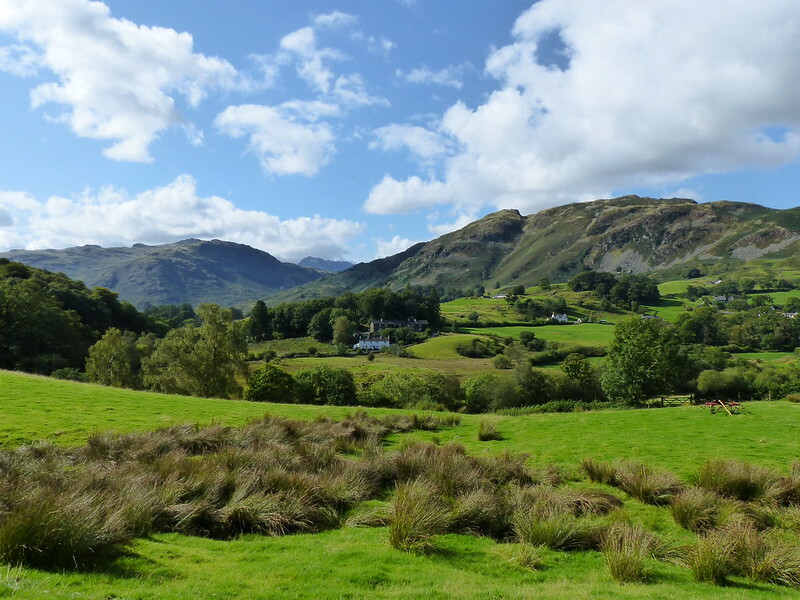 Away from Dodd Bottom, the valley floor is a mass of hummocks which I assume are drumlins. 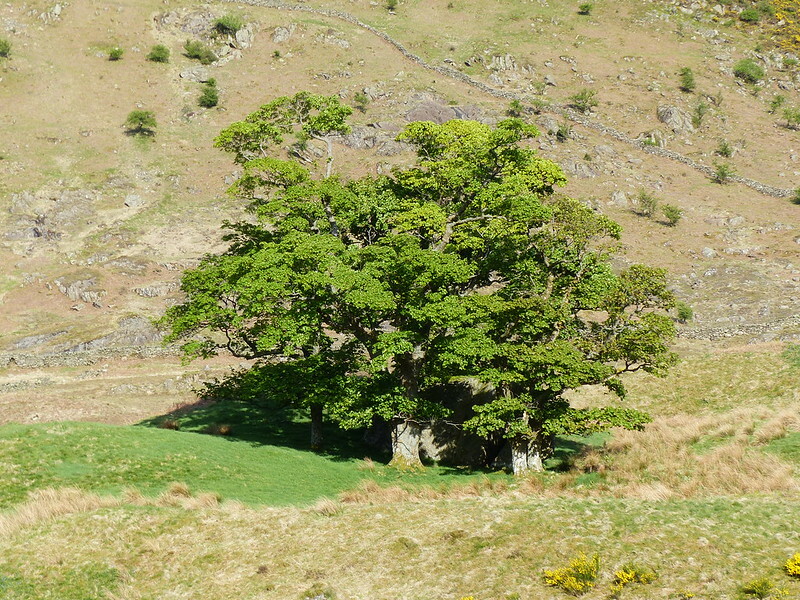 Among the trees on the left we spotted an enormous boulder, presumably another remnant of glacial action…. 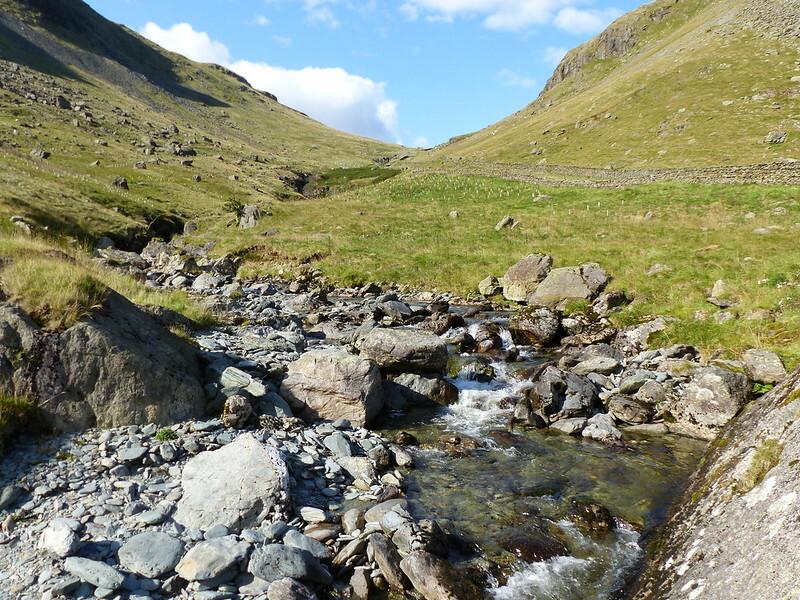 The beck is Mosedale Beck above this steeper section and Swindale Beck once into the valley. Where the transition from one to the other occurs, I couldn’t say. 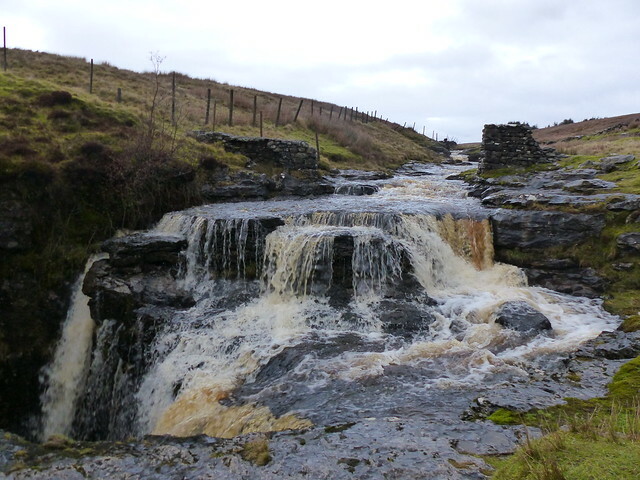 …was washed away by flooding some years ago, but clearly it has been reinstated. 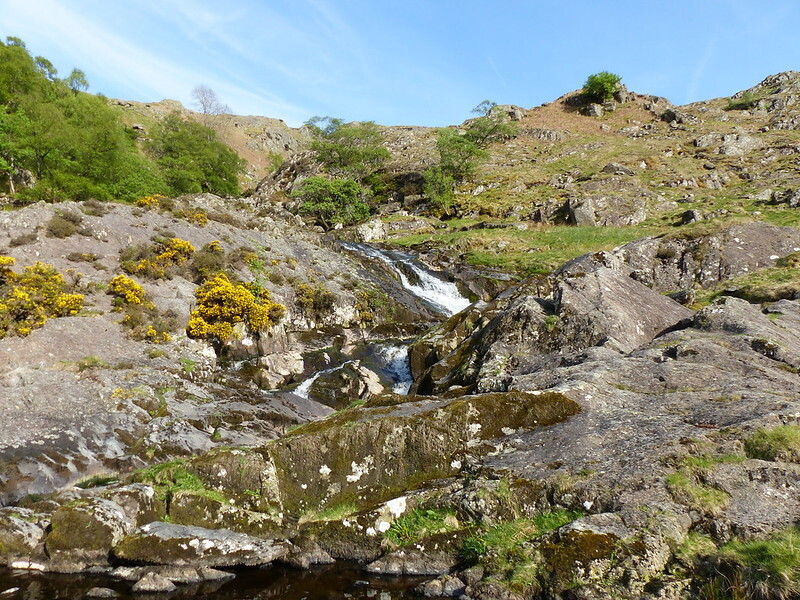 The beck flows through a series of small waterfalls and cascades, with lots of enticing bare rock on either side. The boys and I decided to see how far we could get, without getting wet, by sticking to the rock. I didn’t join them in this pool, it was evidently too shallow for a decent swim. 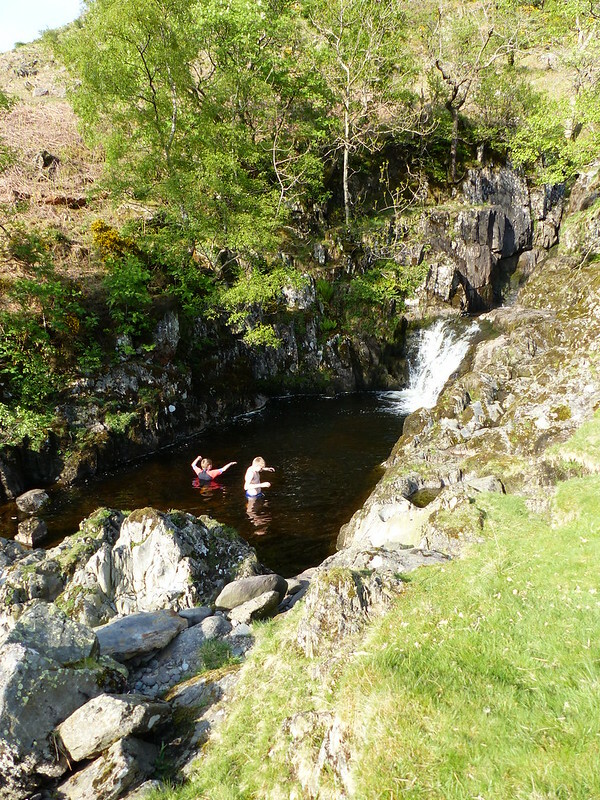 …but whilst it was quite deep, it also contained several very sizable boulders which made swimming quite awkward. The pool above, however, which was sandwiched between two waterfalls, although small, was very deep, and we managed to find a spot from which we could jump in with care, which made B in particular, very happy. 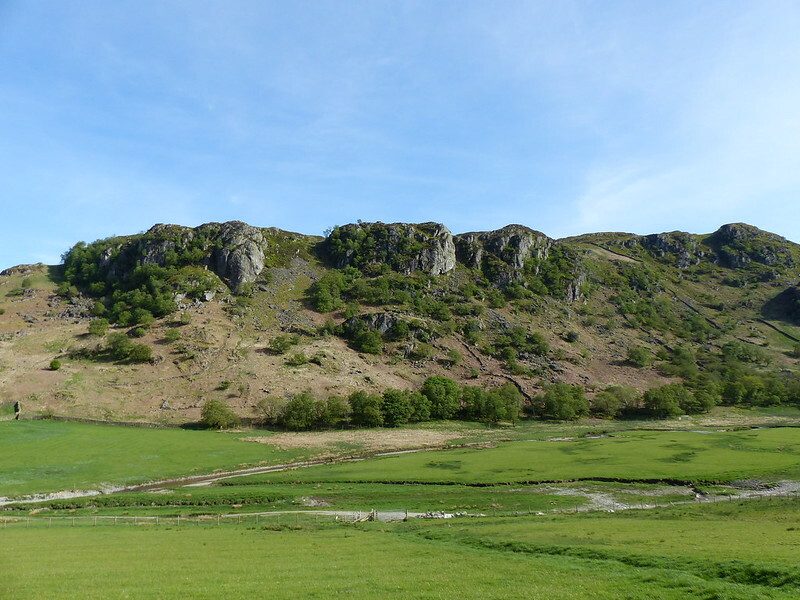 As the sun began to sink behind Hare Shaw, we ate out picnic and then walked back on the other side of the valley, beneath Gouther Crag, on a path not shown on the OS map. Little S had remembered some of the edible wild-plants I introduced to him last year and he gleefully tucked into some Sorrel and Cuckooflower leaves. I’m thrilled with his interest, but wish he would show the same inclination to eat salads and vegetables at home! Incidentally, this valley is excellent for both birds and wildflowers. Photos here from my last visit, which I was stunned to find was as long ago as 2011. Swindale is also almost certainly the last resting place of Little S’s sledge, which he lost to a gale this winter. 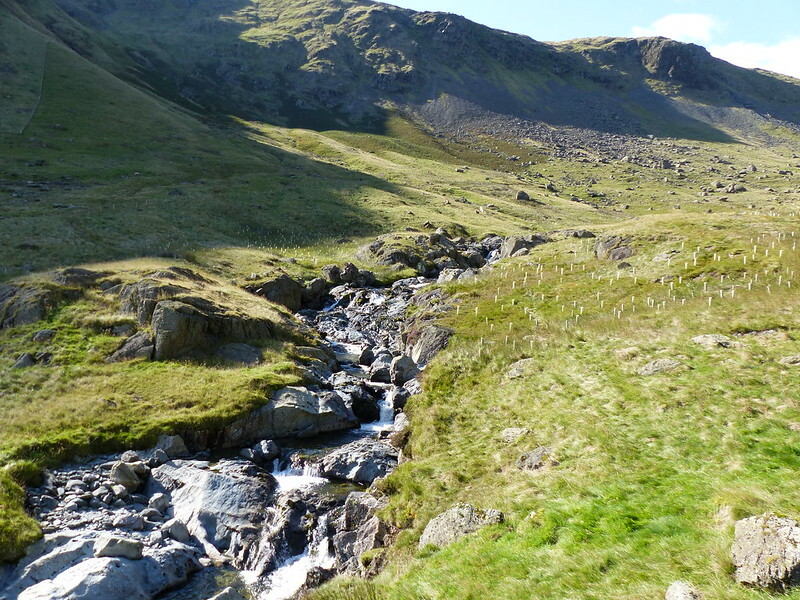 Piers Gill, Lingmell and the Corridor Route. 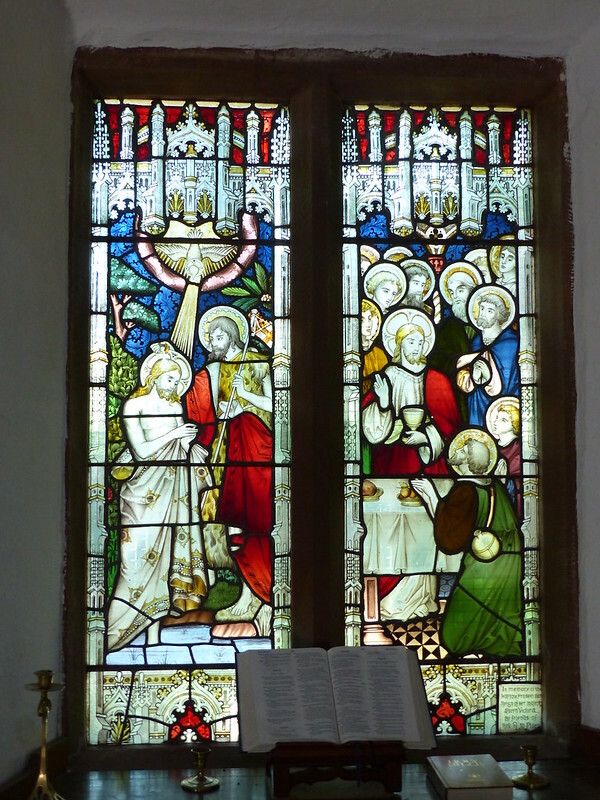 B outside St. Olaf’s Church, Wasdale Head. 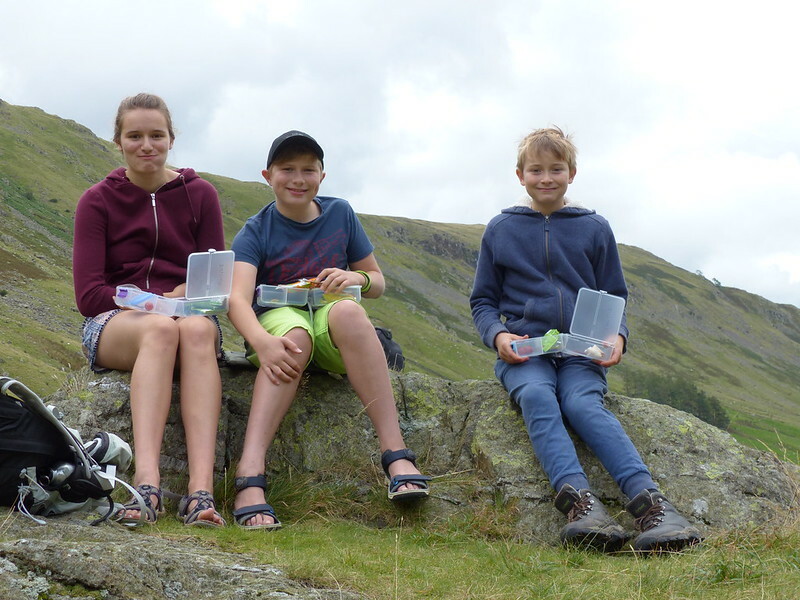 A’s DofE training finished earlier than I had anticipated and we were able to make a leisurely trip up to Nether Wasdale and still arrive with plenty of time to enjoy the sunshine and have a barbecue with some of our friends. Church Stile campsite was heaving, perhaps because of the excellent forecast, but we were able to squeeze in next to J and C and C’s schoolfriend M. It’s a good job that I’d decided not to bother with the trailer tent however, because the ‘large grass plot’ we’d paid for was far from large. Church Stile is a first rate campsite, but extra fields have been added and all of the fields were, frankly, over-full. It was still quiet and friendly, but hot water for showers or washing-up was hard to come by, there were too many people on the site for the facilities to cope with. Hopefully, this was a one off: we’ve been many times before and have always been impressed. Anyway, rant over, back to the real business of this post: other friends of ours were scattered over the site, some in vans, some in caravans, although others were missing, and much missed. After a very leisurely breakfast, some of us gathered together to set off for a walk. 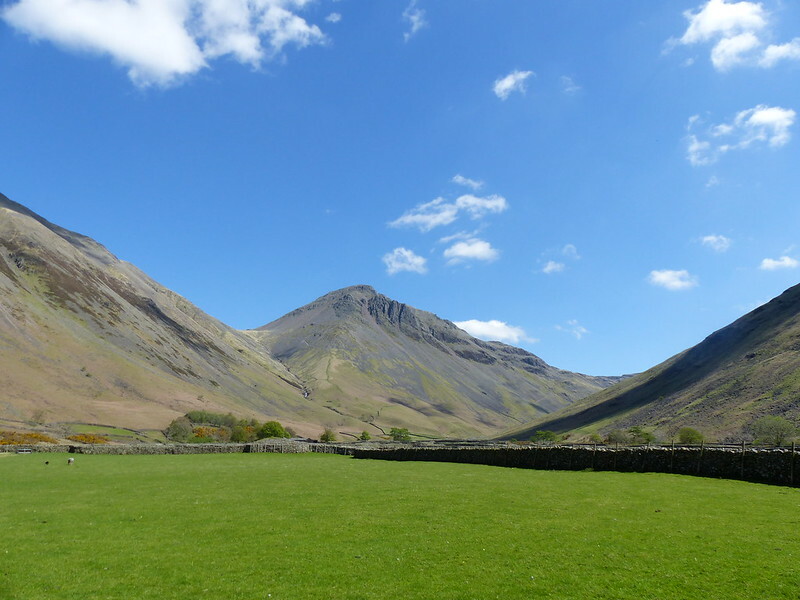 Driving down to Wasdale Head proved to be a bit of a trial, with some real muppetry on display on the narrow lanes and idiotic parking at the end of the valley, but we managed to find spaces despite our very late start. 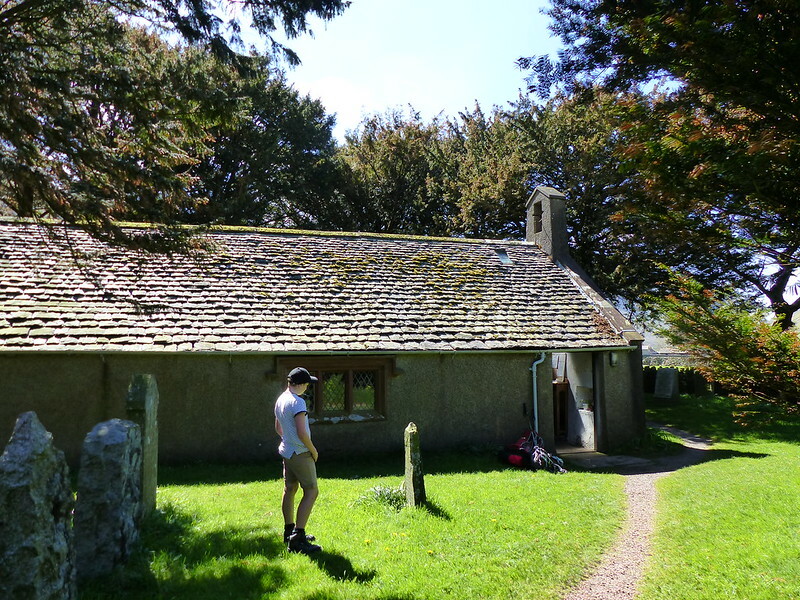 First port of call on the walk was the tiny church at Wasdale Head. 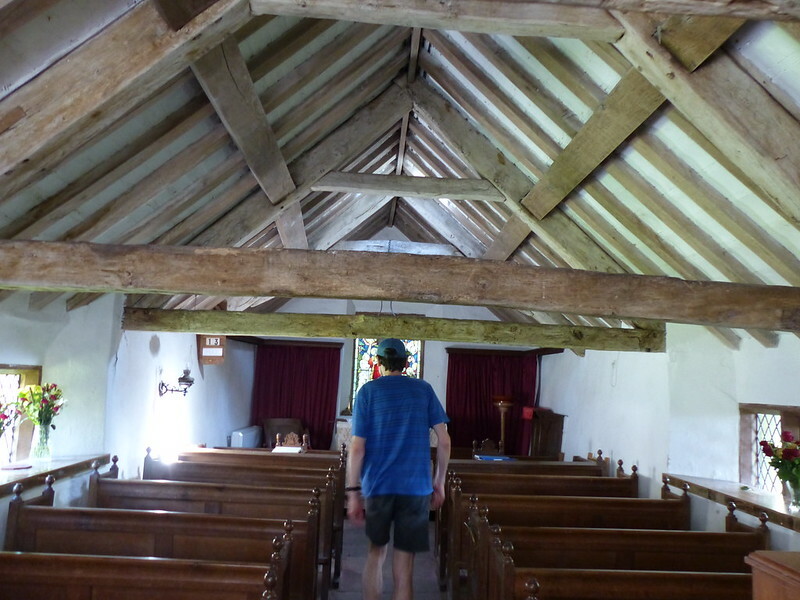 The church is very old, these roof-beams reputedly came from a Viking longship. 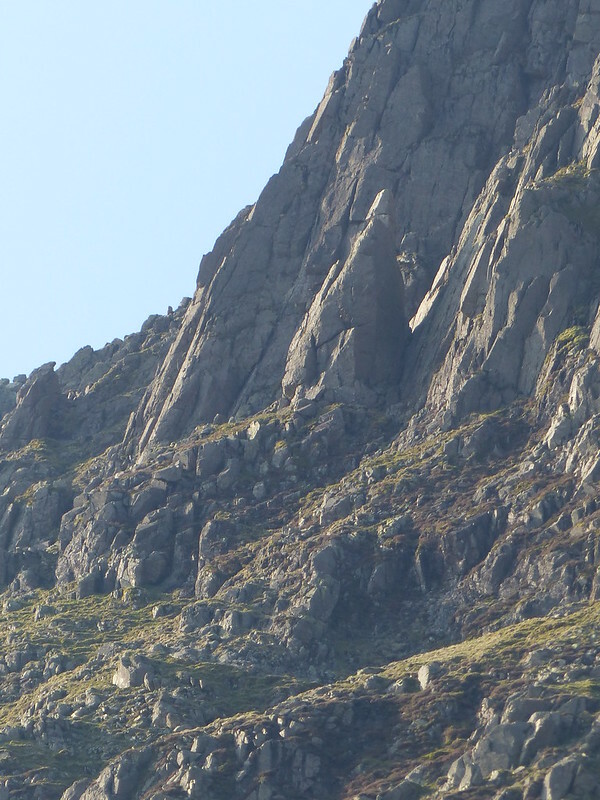 One of the windows apparently has an engraving of Napes Needle, which I seem to have missed – I shall have to go back to investigate. The post title pretty succinctly summarises our route. 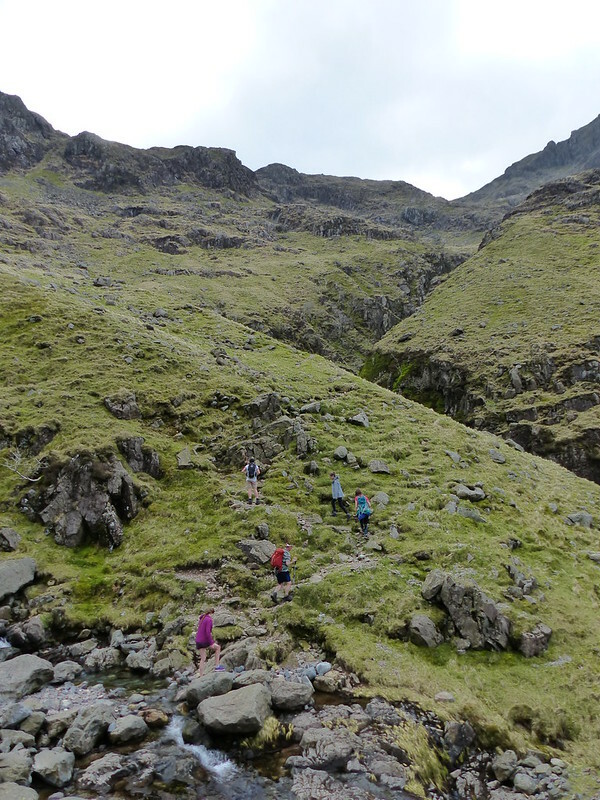 On the OS map, there’s a dotted line which follows the twists and turns of the edge of the deep ravine of Piers Gill. 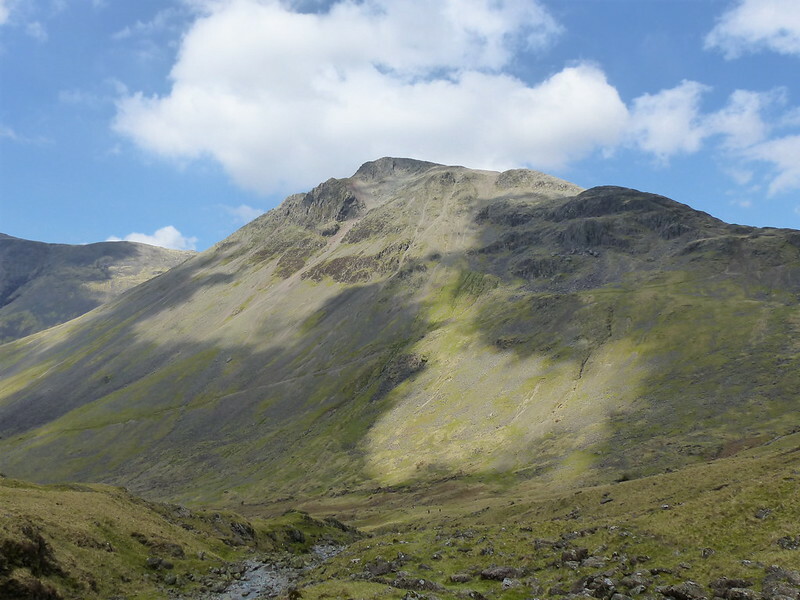 In years of visits to Wasdale, I’ve never climbed that path even though the prospect has always intrigued me. Time to put that right. 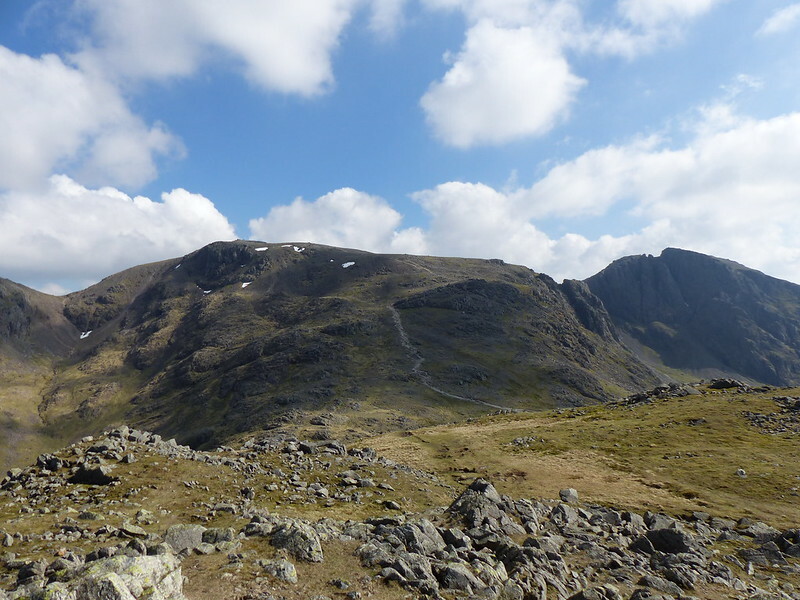 Great Gable from Moses’ Trod. 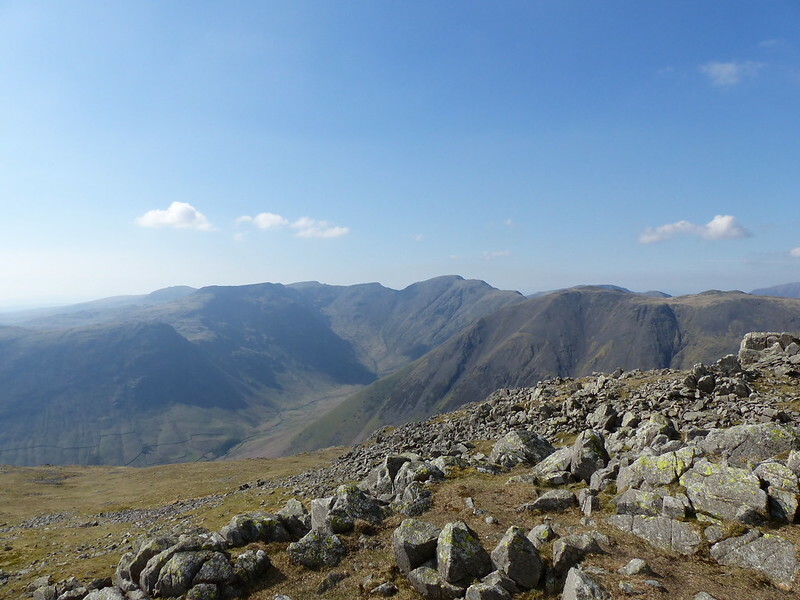 Great Gable would dominate the view all day, which is no bad thing. 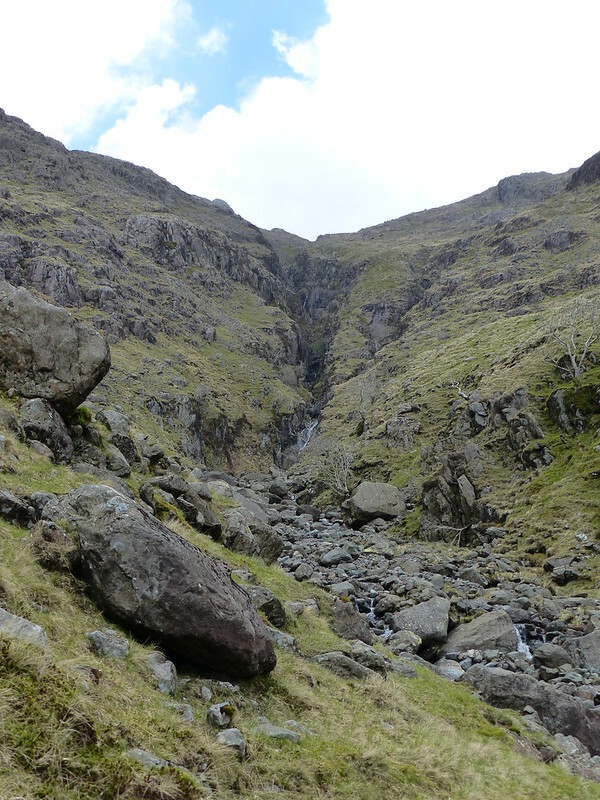 The deep cleft of Piers Gill ahead. 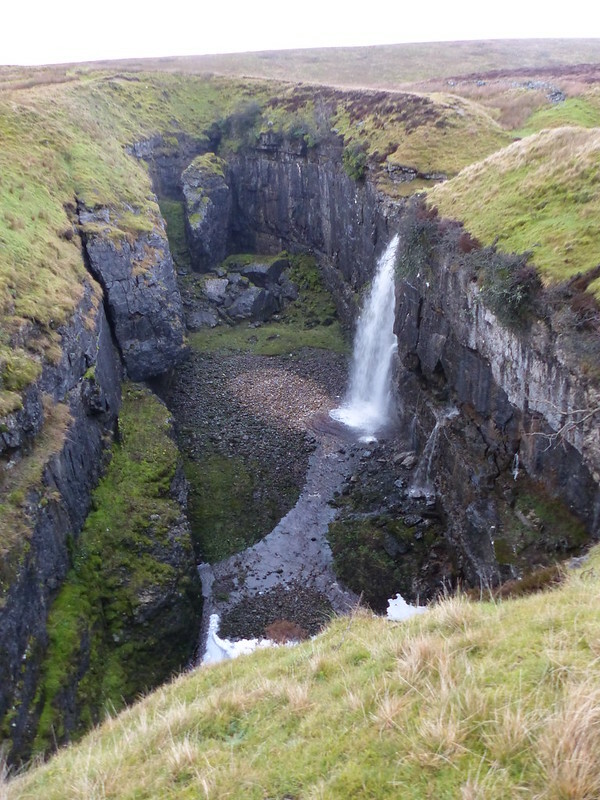 Piers Gill with Lingmell behind. 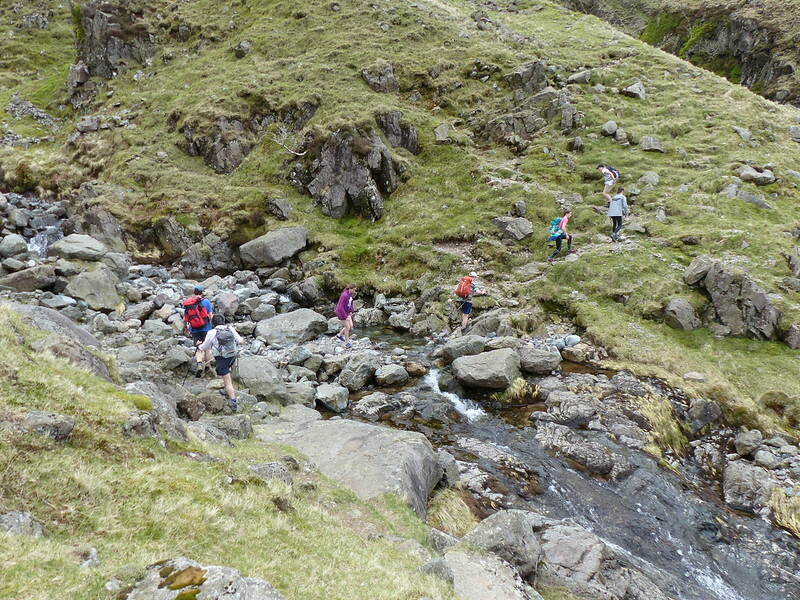 The ascent beside Piers Gill was steep and I was still suffering with a rattling cough, which is my way of saying that I was very slow and probably held the others up no end. But they should probably thank me for that: this is rough, inspiring mountain scenery which, in my opinion, has no equal, in England at least. 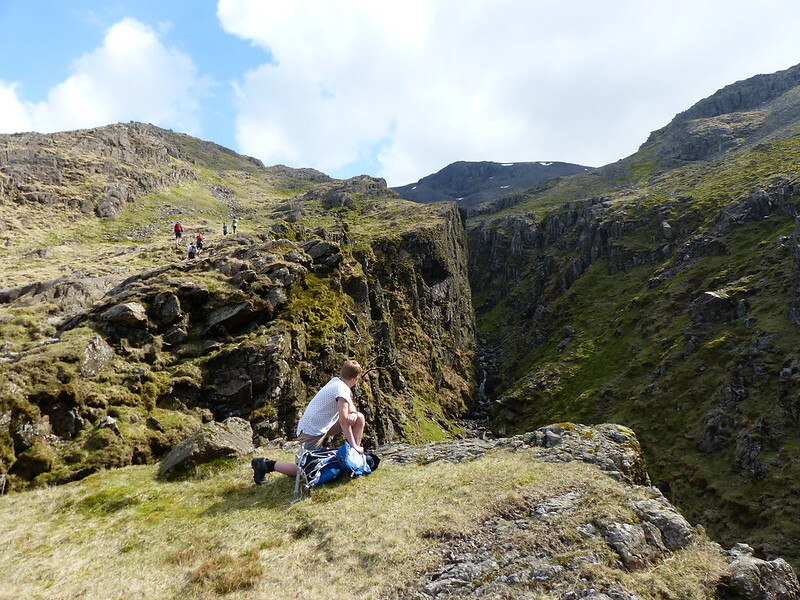 I can think of hills in Scotland which are crag-bound and steep and as awe-inspiringly formidable as this area, but I can’t think of a match in the Lakes. 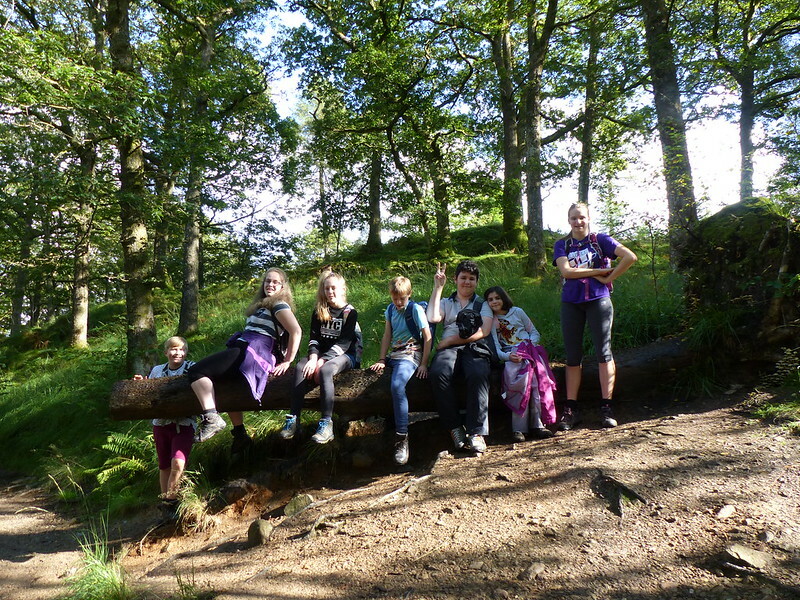 There was even a little easy scrambling to be had – which was highly amusing, as the children were solicitously checking that the adults were ‘alright’. 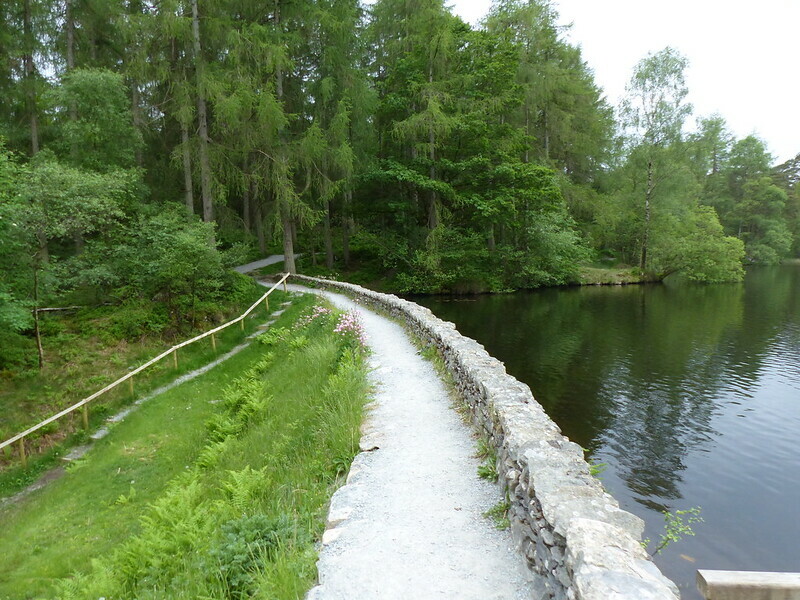 The path beside Piers Gill. 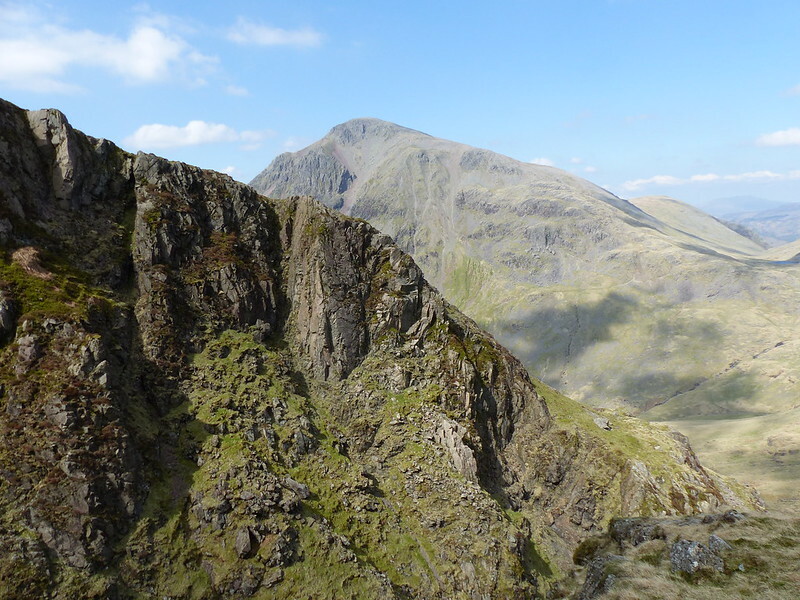 Looking across one bank of the gill to Gable (of course). The Adopted Yorkshireman on Lingmell. We seemed to have numerous lunch stops, but I didn’t take advantage of any of them for a collective group photo. I think I was genuinely a bit worn out. 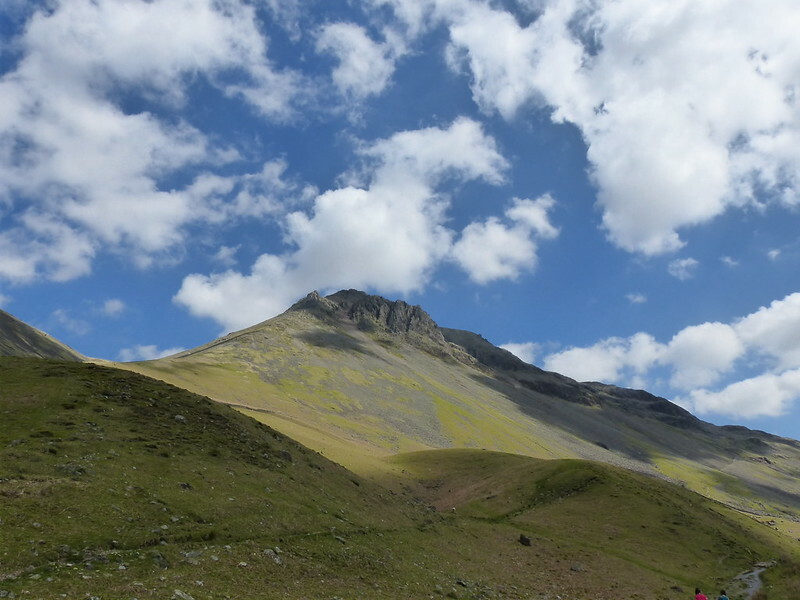 Eventually, we made it to Lingmell. 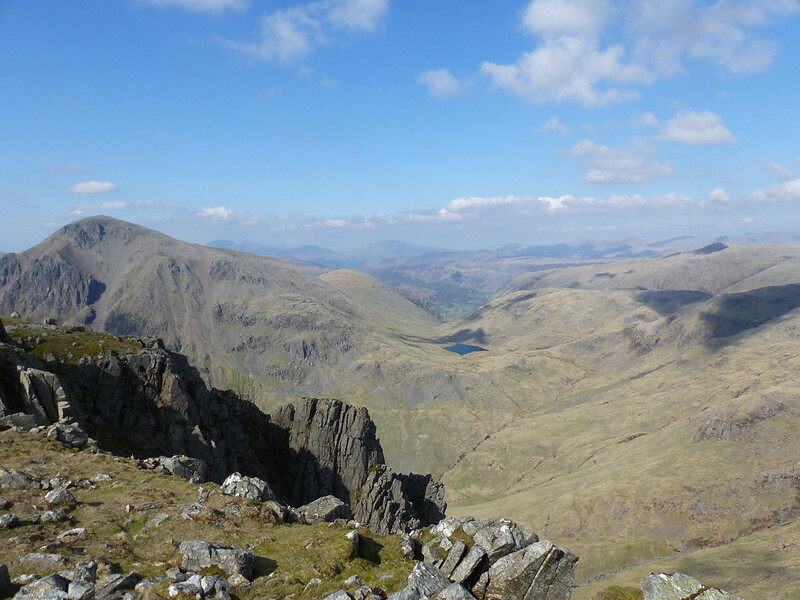 Gable and Styhead Tarn from Lingmell. 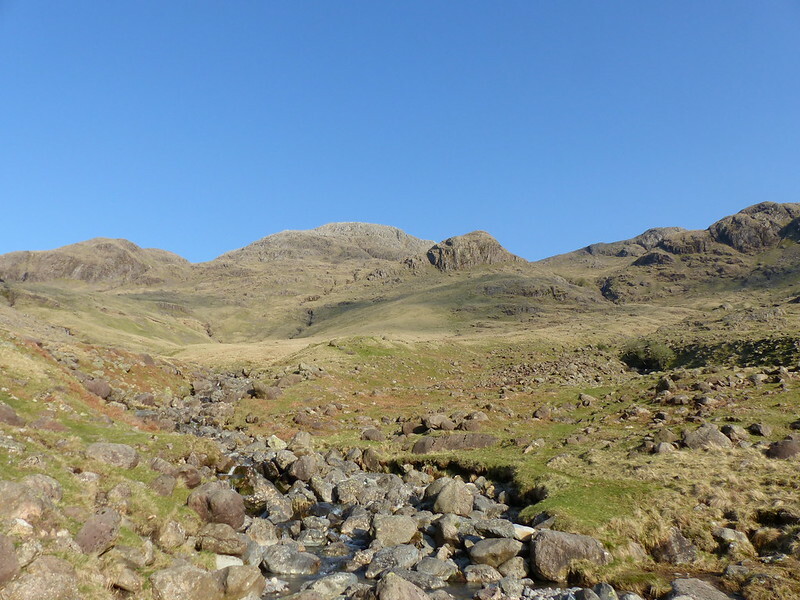 Scafell Pike and Scafell from Lingmell. 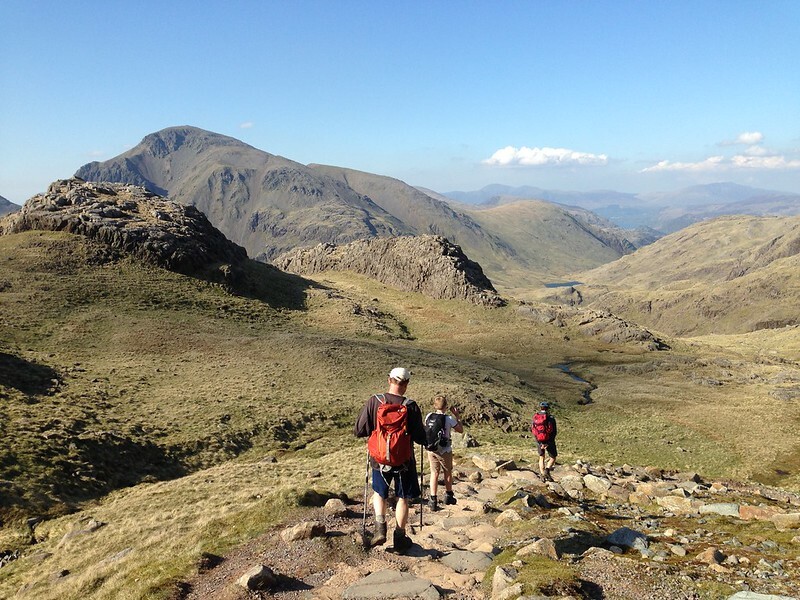 Old Father Sheffield half-mooted the idea of continuing on to Scafell Pike, but his suggestion didn’t meet with any enthusiasm. 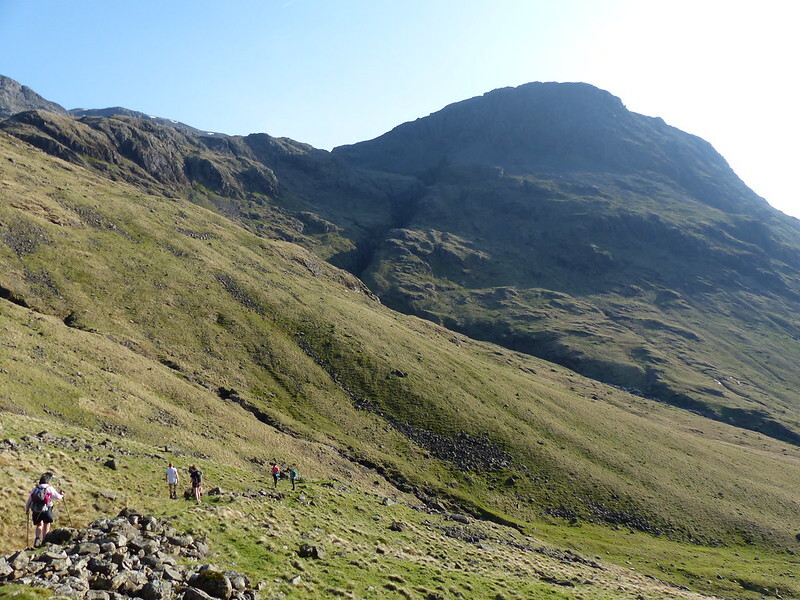 Scafell Pike is always thronged, even on a rotten day, and today it looked like it was absolutely overrun. Besides which, A and B and I were up there relatively recently. And I was already cream-crackered. 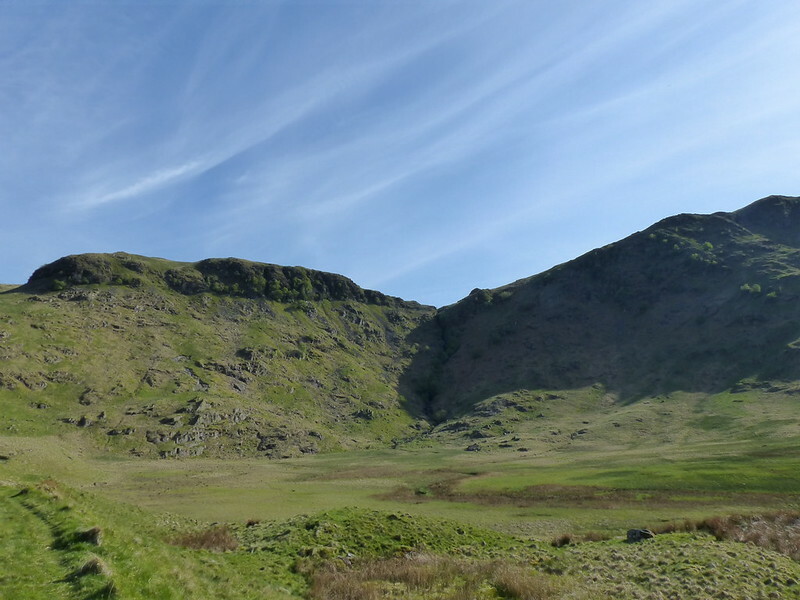 Red Pike, Pillar and Kirk Fell. 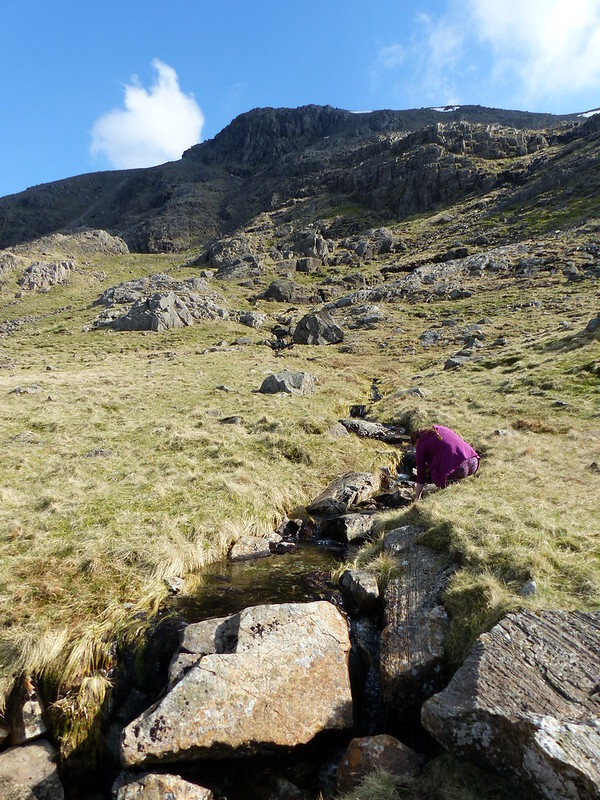 A filling our bottles from one of the streams which feed Piers Gill. Heading down the Corridor Route. OFS seems to have a hankie on his head. I think it was actually an Eddy Merckx style cycling cap. Round How and Great End. I suggested diverting to Round How and Lambfoot Dub, but then decided that was too much effort and left the AYM to do it on his own. 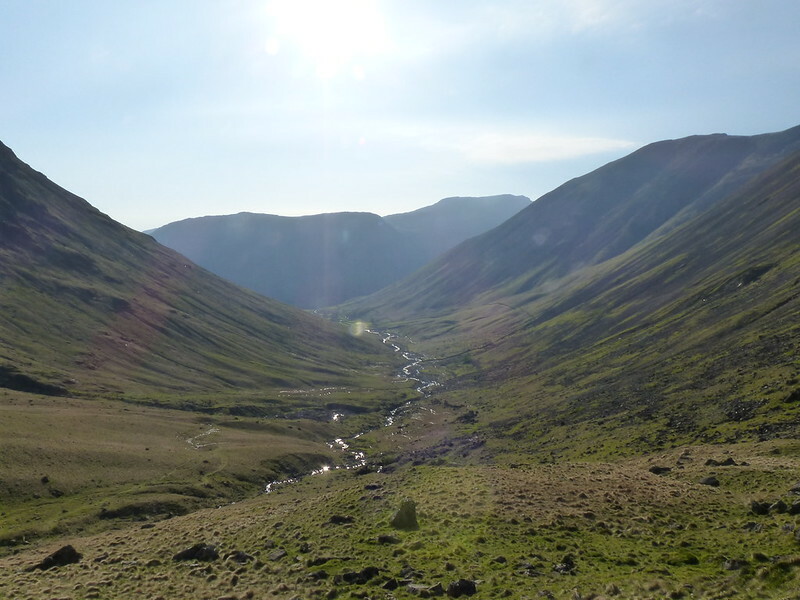 Looking back down the valley towards Wasdale Head. 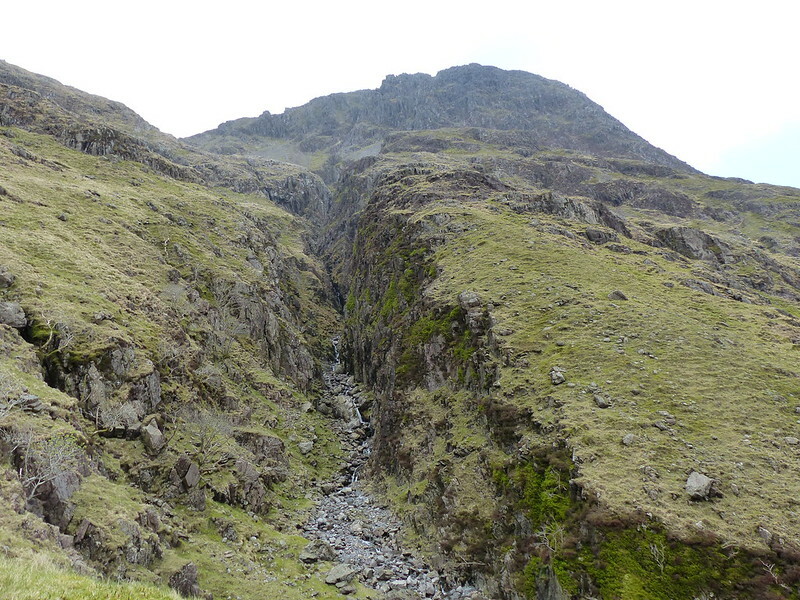 Piers Gill and Lingmell from our descent route. We came down a superb, well-made path, clearly very old, with nice easy zig-zags. 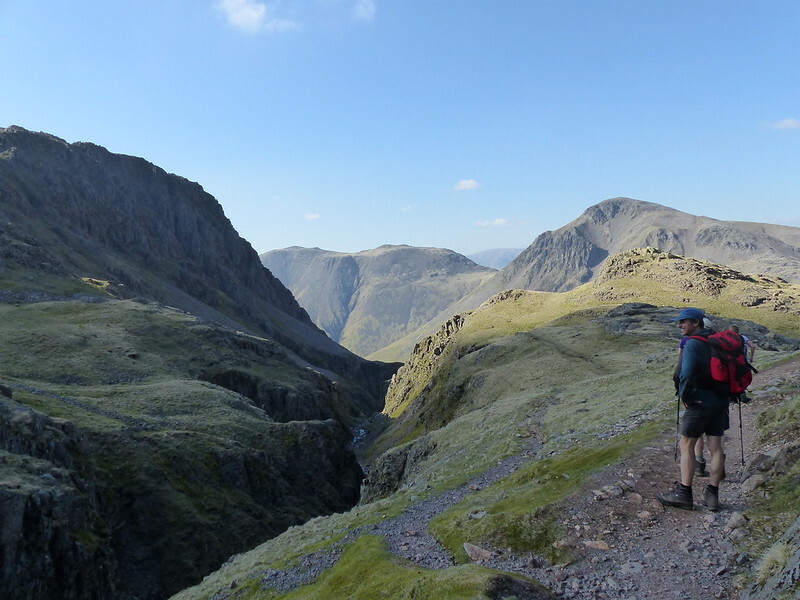 I felt sure that I had been down this way before, perhaps it was with CJ when we stayed at the Wasdale Head Hotel. 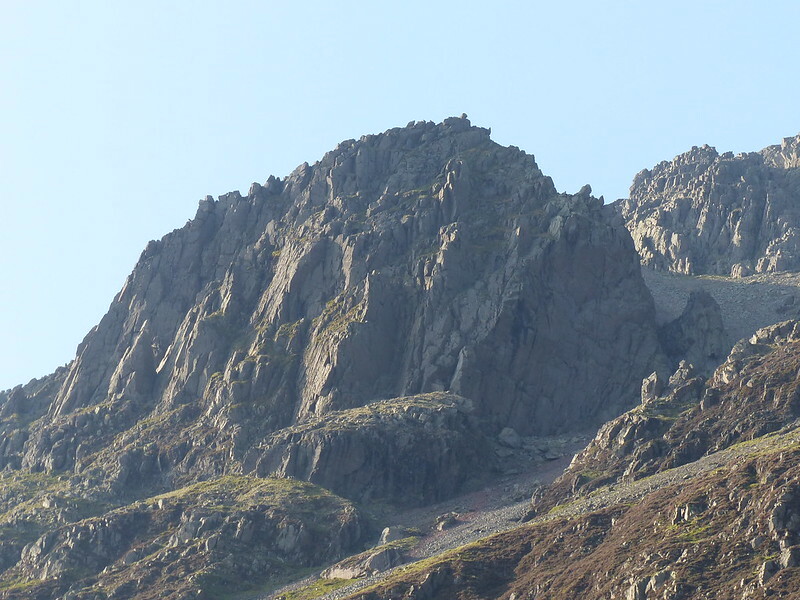 Napes Needle on the left. (I think). A superb day. 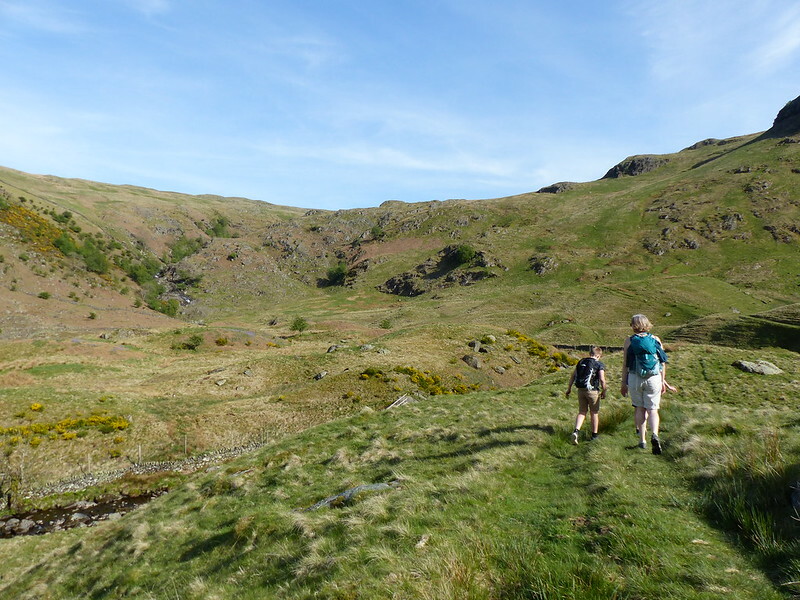 I’ve been walking in these hills, with these same friends (well, the AYM anyway), for over thirty years. I hope that this day will live as long in the memories of the four children who were with us as many of my previous outings have with me. Later, back at the campsite, another barbecue. B and I had Church Stile’s own Herdwick burgers, which were delicious. Then, for the second night running, a chinwag around a wood-fire burning in the portable fire-pit which TBH bought me for Christmas. 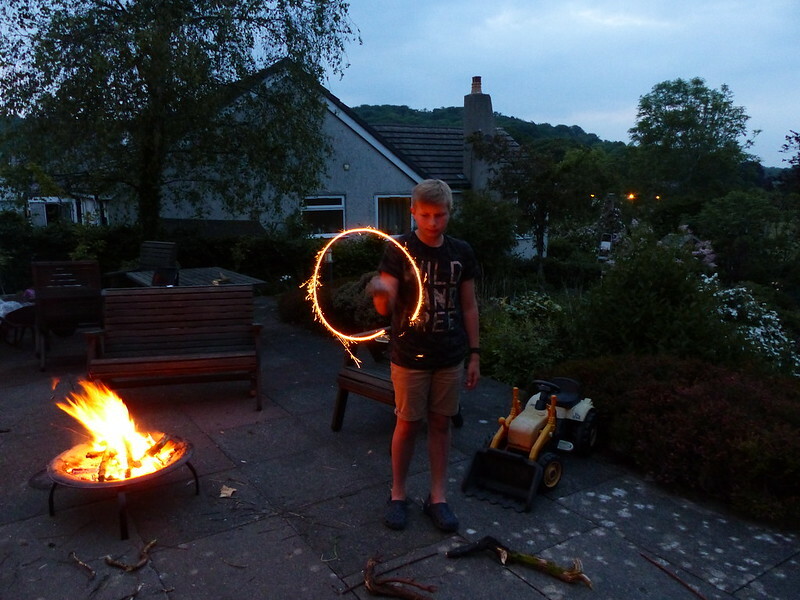 B tended the fire whilst I sampled some Ennerdale Brewery Beer. I didn’t know there was an Ennerdale Brewery until I saw some bottles in the camp site shop, but I can now report that their beers are very palatable. Marvellous. 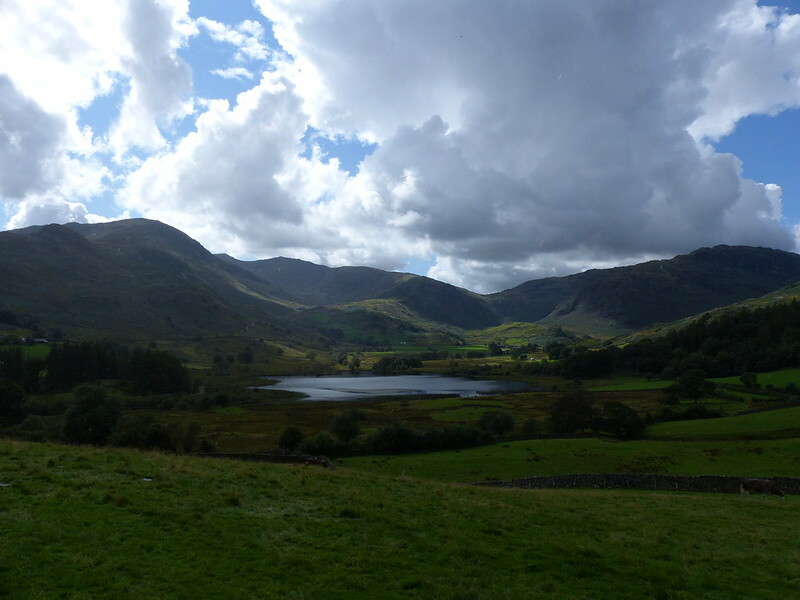 …the cloud finally broke and the sun shone for much of the rest of the afternoon. 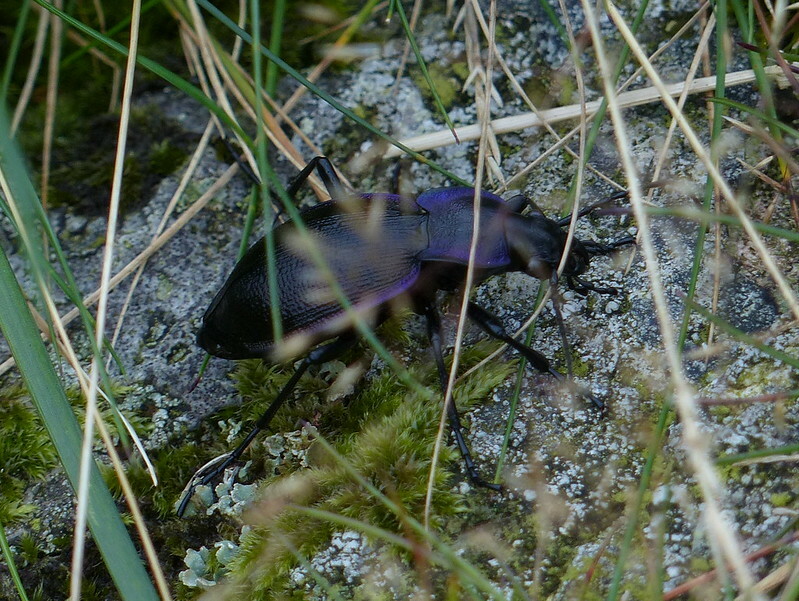 This beetle was on the patch of rock where I set up my stove. It scampered away rather shyly and when I fetched it out from under a boulder, I noticed a rather unpleasant smell – I’m not sure if this was a defence mechanism from the beetle or the scent of something else concealed by the boulder. The beetle looks very like the one in my previous post, but I think that the obvious striations on its back mean that it is of a related, but different, species. Anyway, between the two sets of photos, we were playing in the stream. 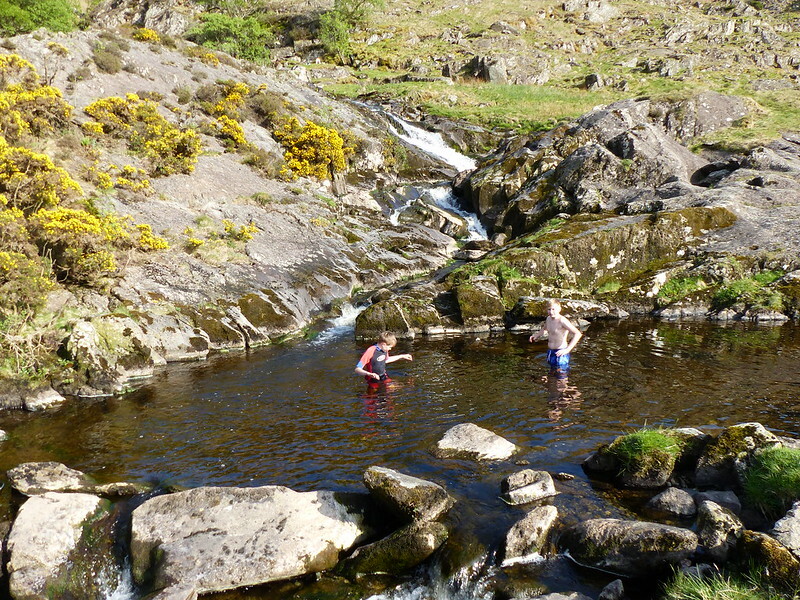 It was a week after our visit to Tongue Pot; B was really keen to go back there, but I persuaded him that there were opportunities for swimming closer to home. 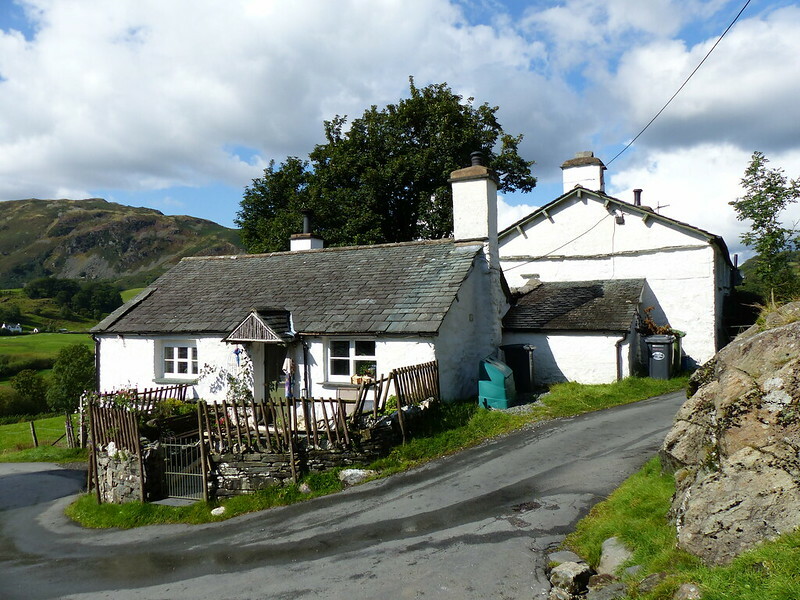 We drove to Sadgill, in Longsleddale, and then walked up the valley until we reached the access land and a convenient gate in the wall. 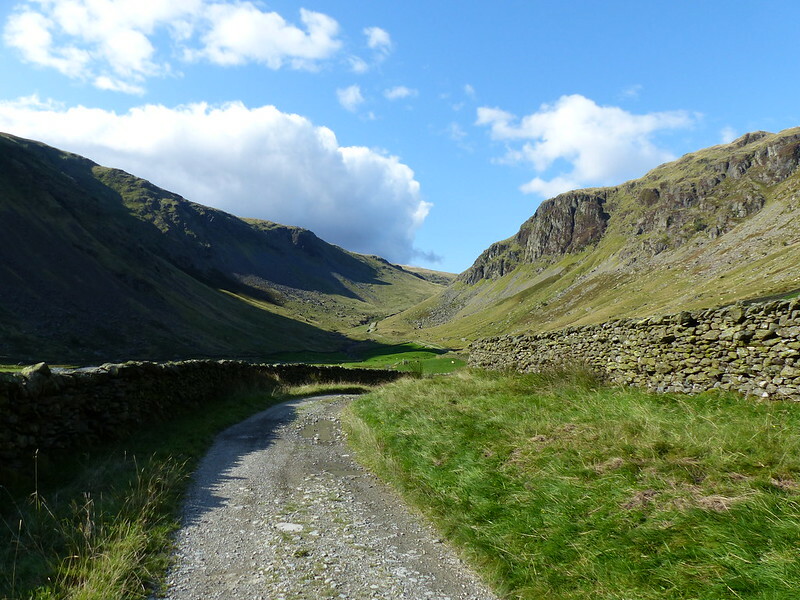 The track, which heads towards the Gatescarth Pass, was busy, not with walkers, there was just one other party of adults and toddlers, heading for the stream like us, but with four-wheel drives and trials bikes. I’ll let you fume on my behalf. 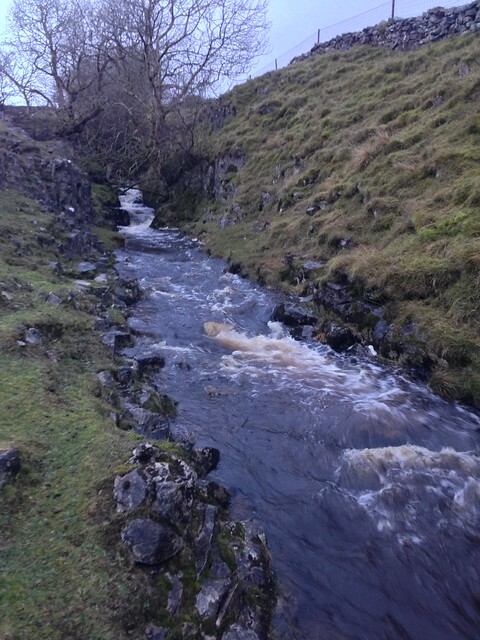 I’ve called the post Wren Gill and higher upstream that’s how it begins. 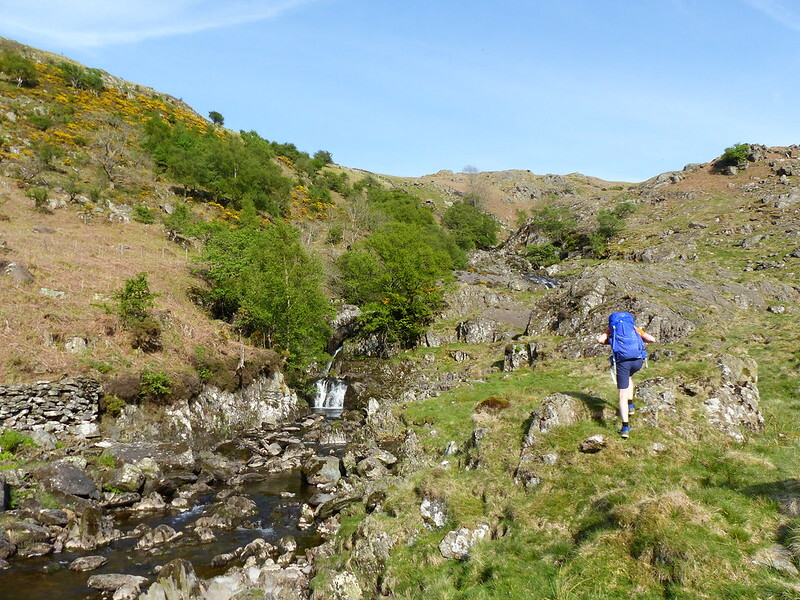 But down the valley it’s the River Sprint and, to add to the confusion, the OS map has Cleft Ghyll too, although that’s written in black rather than blue, so may refer to the narrow deep-sided ravine the stream briefly flows through. 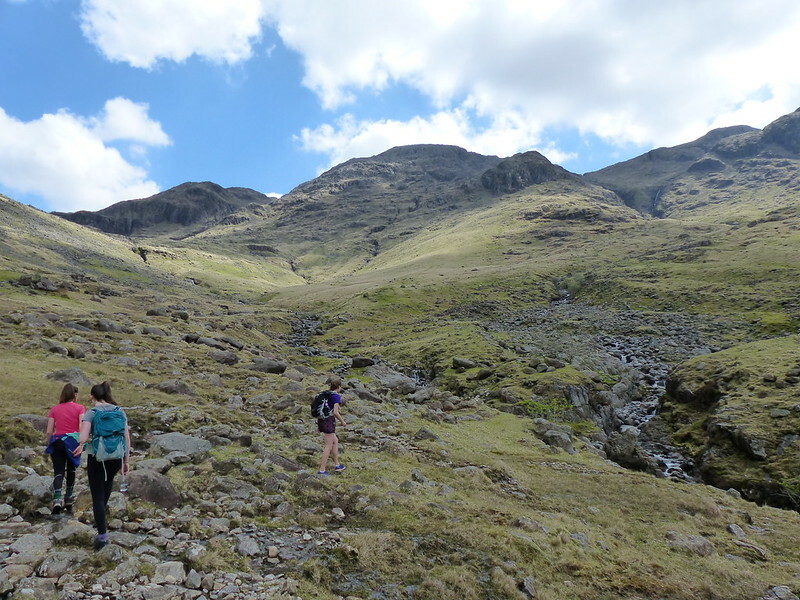 We followed the stream bed from just beyond the boundary of the access land up to where the stream poured over a waterfall out of Cleft Ghyll. Then we walked down to where we’d started and did it all again. 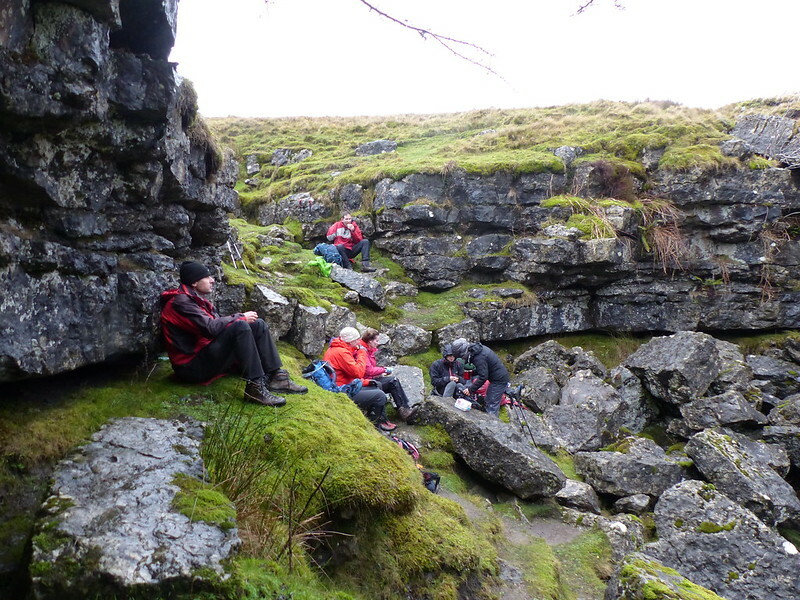 The first time we tried to keep reasonably dry and kept out of the deeper water, which gave us a chance to have a bit of a reccy first and also meant that nobody got too cold too quickly. The second time we took the opposite approach and swam wherever we could. We found a couple places where we could jump in, much to B’s delight, and also a powerful cascade which made a brilliant waterslide, although I was a bit disappointed that the kids all seemed to be able to get down without getting dunked in the pool at the bottom, a feat which I failed to replicate. 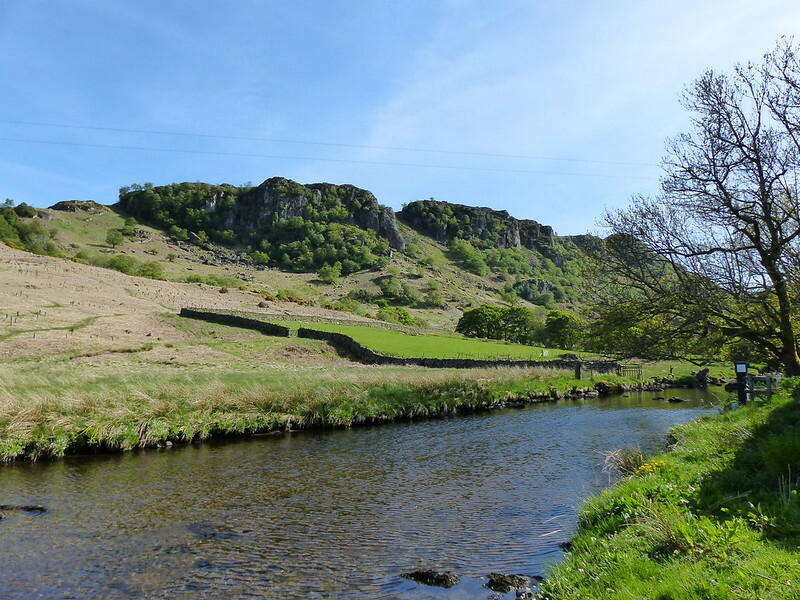 After a few days without rain, the water was much warmer than it had been in the River Esk a week before. The weather helped too. 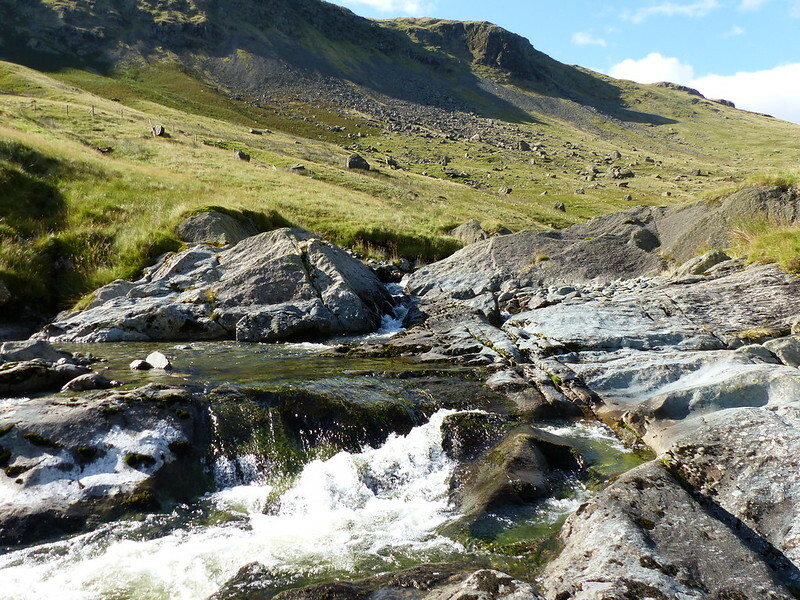 It would be interesting to go back after a longer dry spell to have a go at the Cleft Ghyll section and beyond. 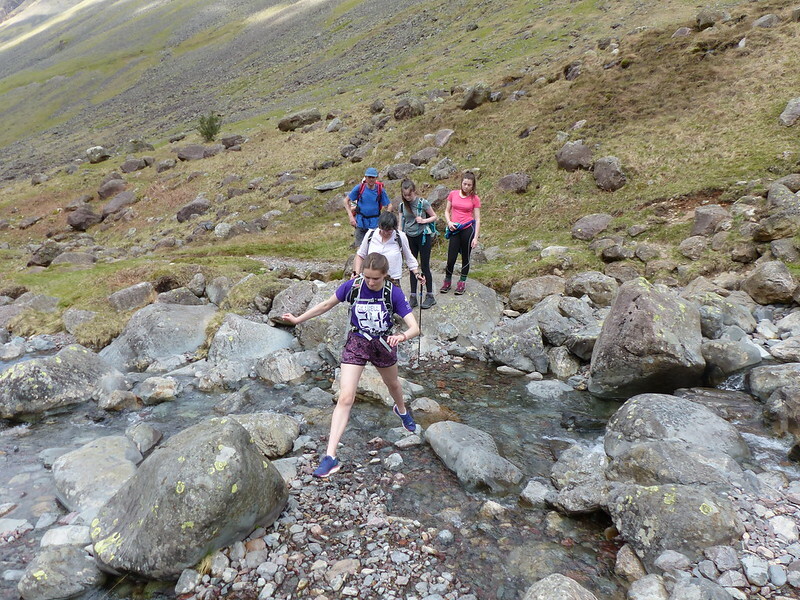 Anyway, the kids are definitely sold on the idea of messing about in streams. 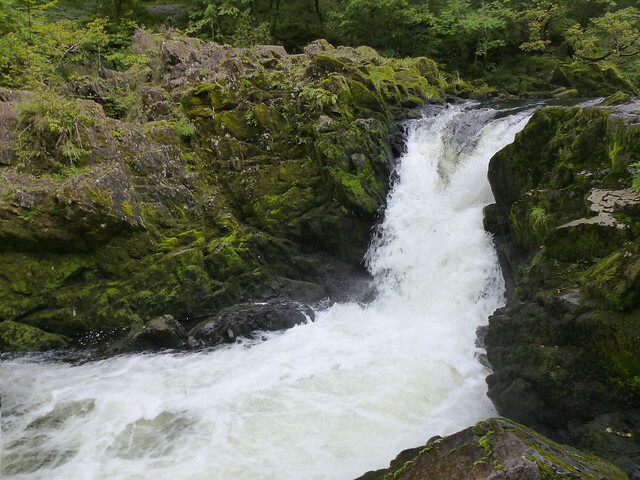 Skelwith Bridge – Skelwith Force – Elter Water – Elterwater – Little Langdale – Slater Bridge – Stang End – High Park – Colwith Force – Skelwith Bridge. The Langdale Pikes seen across Elter Water. How appropriate, after a post about favourite walks, that in my next bit of catching up from the summer hols, I’m recounting a walk which, in slight variations, I’ve walked many times, in all seasons, in all weathers, alone on occasions but often with big groups of friends and which definitely qualifies at least as one of my favourites, particularly for when time is short, or the forecast is a bit iffy. A dodgy forecast was partly responsible for us choosing this route. 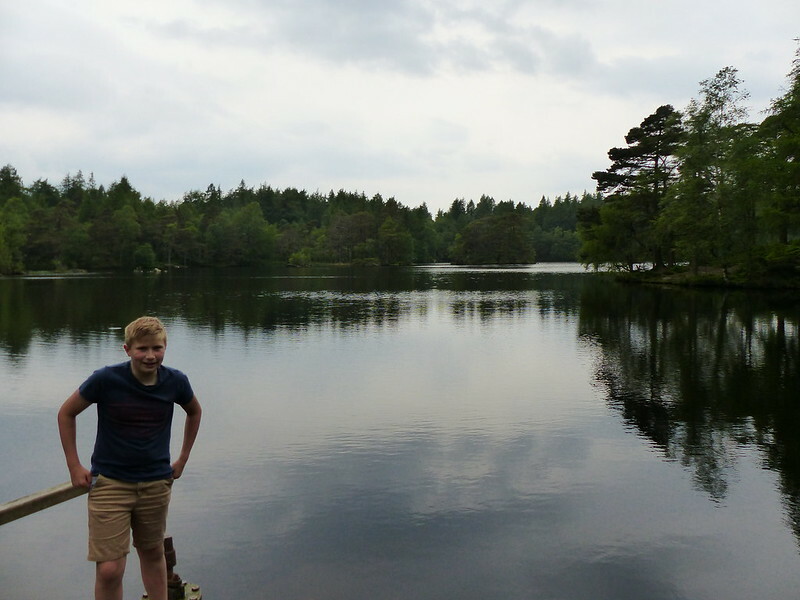 We were going out with our friends Beaver B and G and their family again; the original plan had been to get the boats out on one of the lakes, but with showers, possibly prolonged, expected, we decided that a low level walk was a better option. We’d actually run through a number of alternatives the night before and it was eventually G who suggested something in this area. 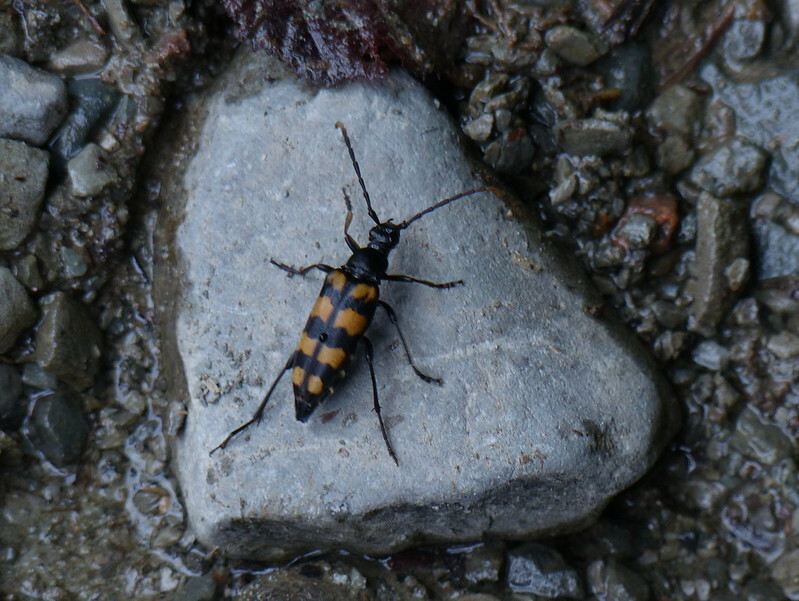 Black and Yellow Longhorn Beetle (Leptura quadrifasciata). 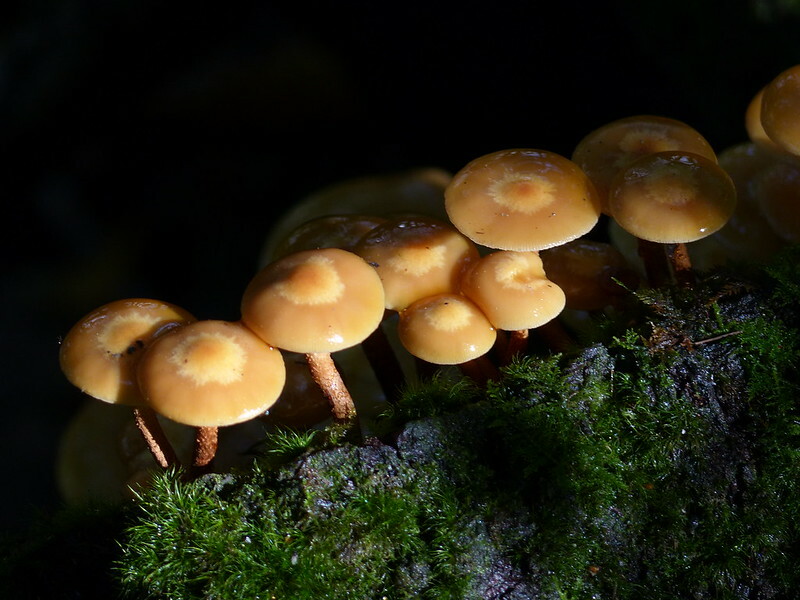 This was spotted by Little B pretty much at the top of the track between Langdale and Little Langdale and it led us both a merry dance as we tried to photograph it in damp and gloomy conditions. It’s led me on another merry dance as I’ve tried to identify it – I was struck by it’s superficial resemblance to the Sexton beetle which I photographed recently, which wasn’t helpful because this is not even a closely related species. 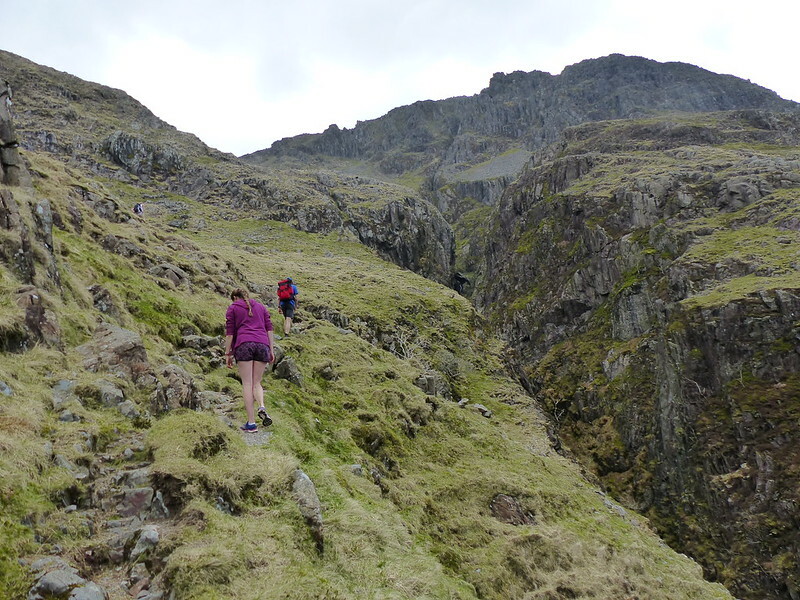 We’d had drizzle, then a bright spell as we lunched by Elter Water, then rain as we climbed up and over into Little Langdale. Now it began to brighten up. 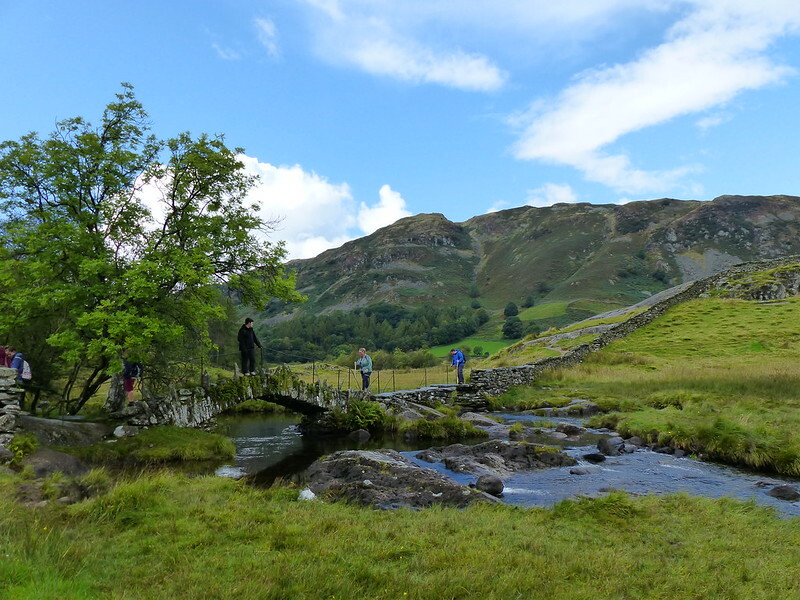 Over Slater’s bridge and heading along Little Langdale we paused a while to watch cyclists riding their bikes through a ford on the infant River Brathay and then, a little further along, spotted a Roe deer down by the stream. 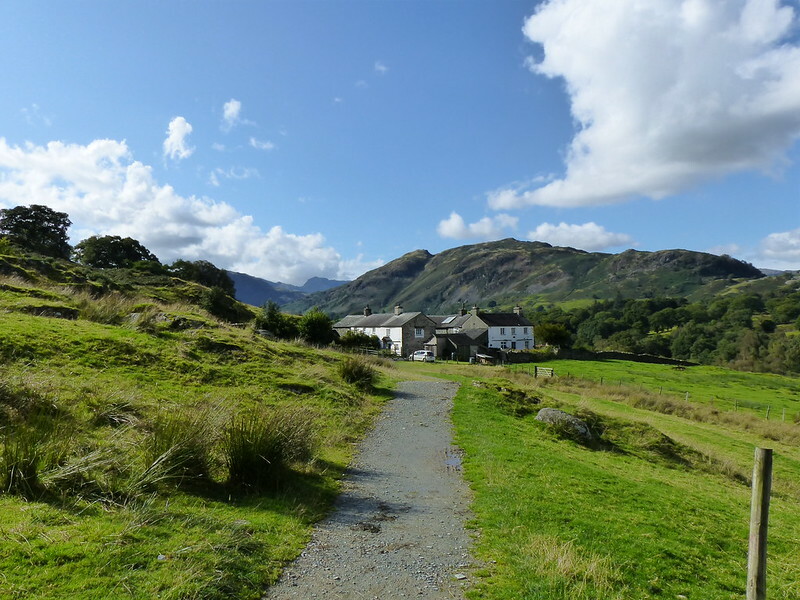 Little Langdale. 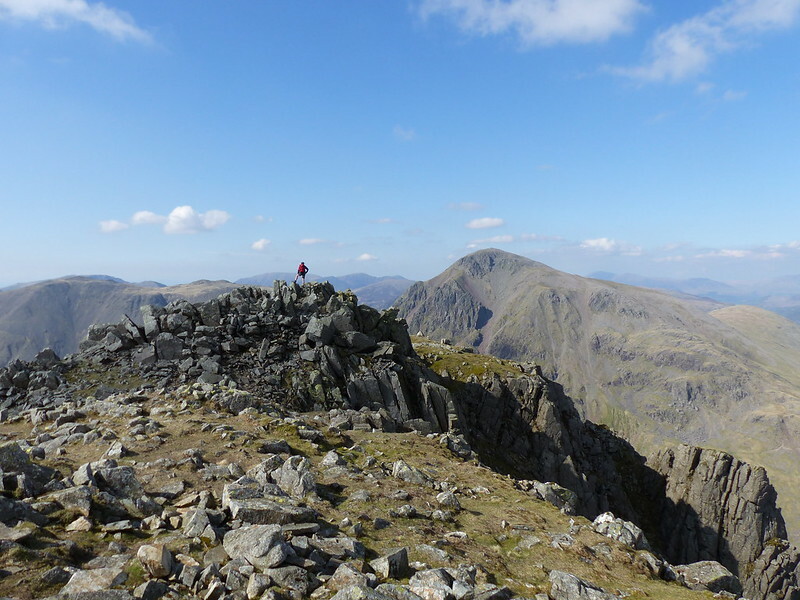 Blake Rigg on Pike O’Blisco and Busk Pike on Lingmoor behind. 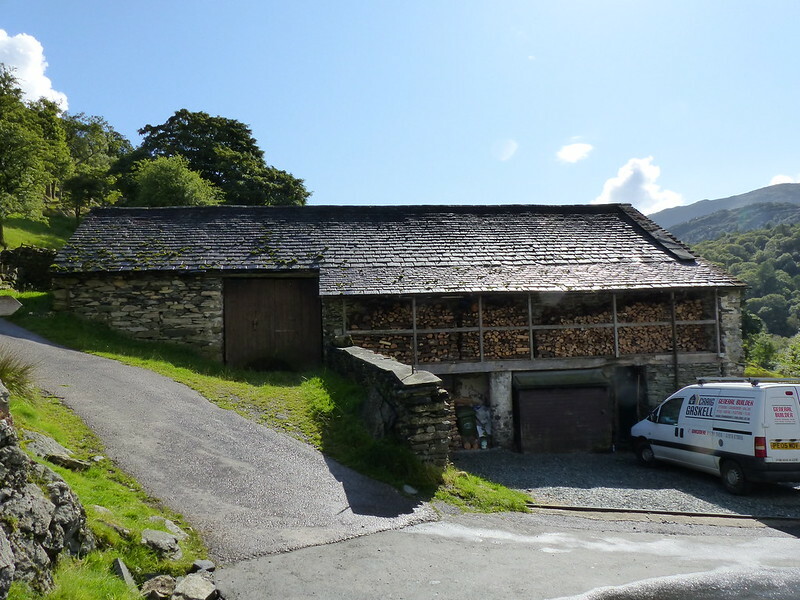 The barn at Stang End with it’s impressive tiers of stacked fire wood. Our perseverance through the rain was paying off now with some beautiful warm, sunny weather. 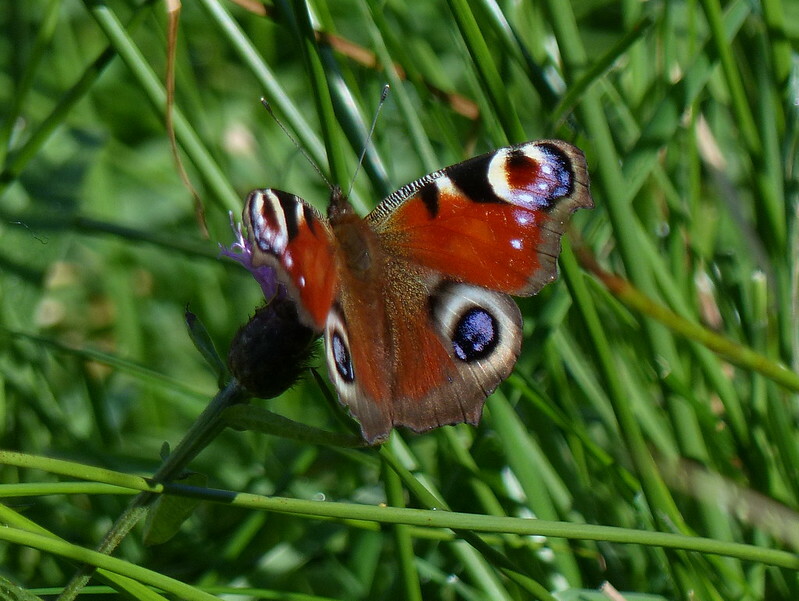 The garden at Stang End was busy with Red Admiral and Peacock butterflies sunning themselves. 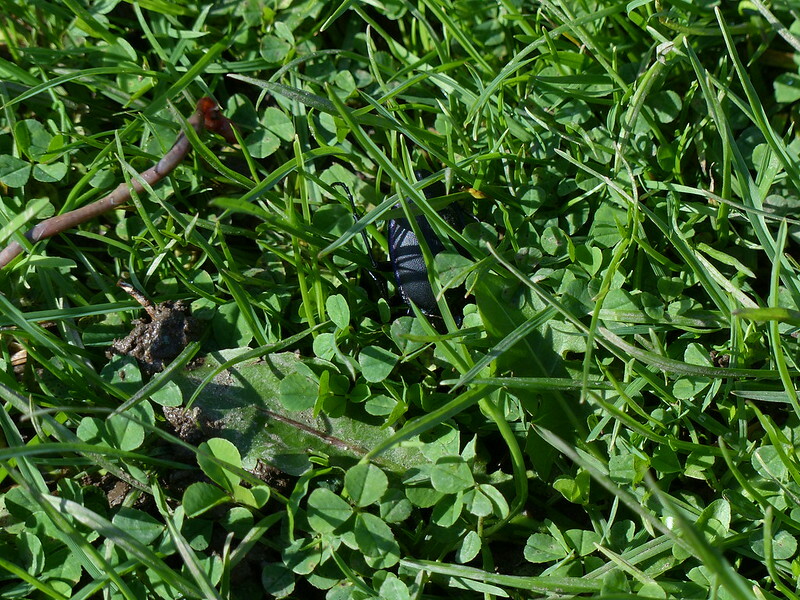 We interrupted this large beetle, here already scuttling for cover, as it was preying on the earthworm seen in the top left of the picture. 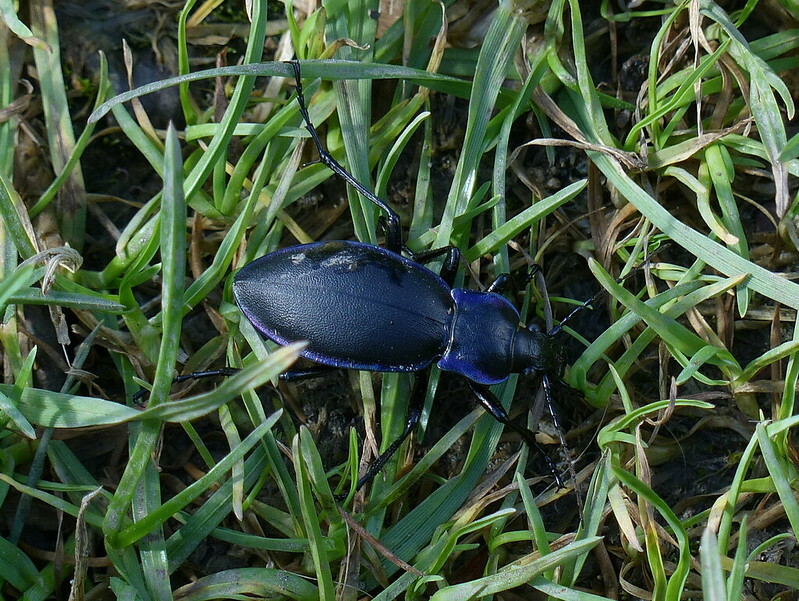 I’m reasonably sure that this is a Violet Ground Beetle, Carabus violaceus, although there are several very similar species of large, black beetles which also have that violet tint. I haven’t featured a Robin in the blog for an unusually long time. 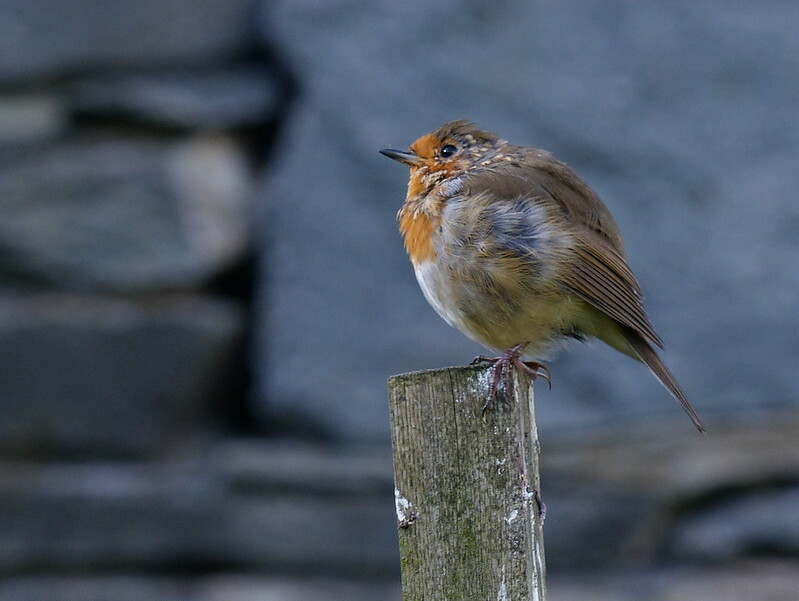 This one looks a bit tatty, but juvenile Robins have speckled feathers, which are moulted at around two to three months, so could this be a juvenile, born in May or June, which has almost changed into adult plumage? 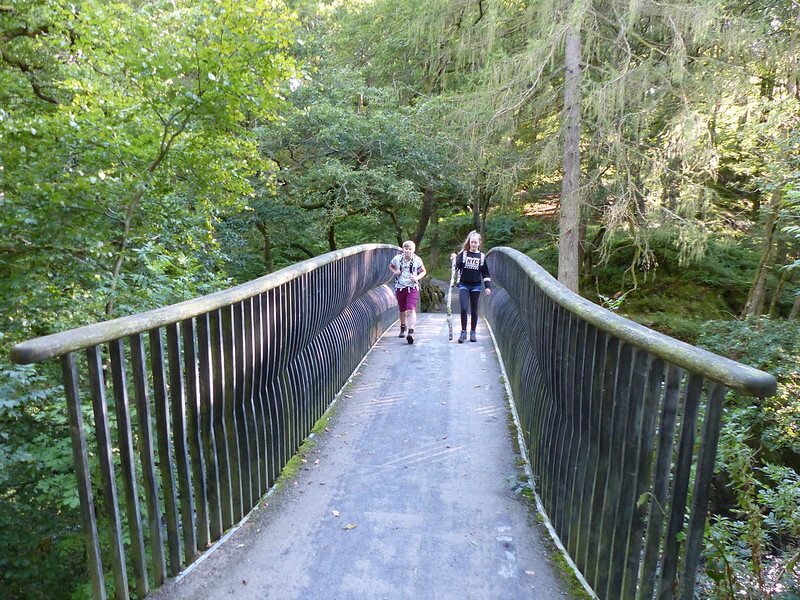 Almost back, crossing the footbridge near Skelwith Bridge. 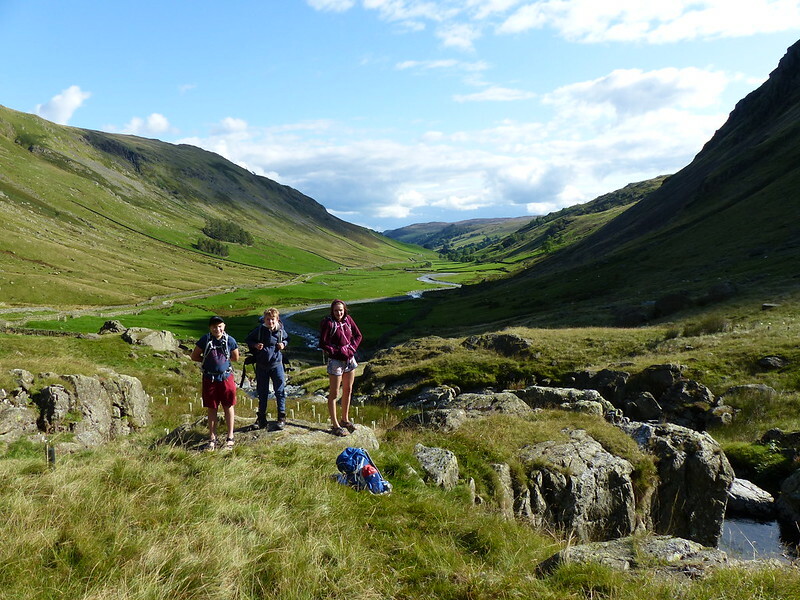 We were quite late finishing, having not set-off particularly early, and had wondered whether the promised tea and cake at Chesters By The River would be thwarted, but the new take-away section (well, new since I was last there) was still serving, so a mutiny by the kids was averted. I had the beluga lentil dish, seen near the front of the counter above, as an alternative to cake, and very nice it was too. 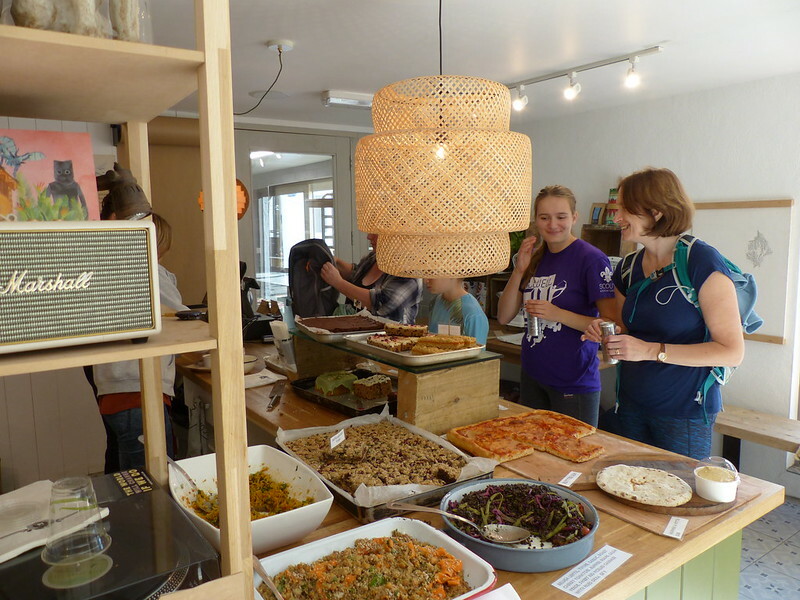 Chesters, both cafe and shop, had been very busy when we had passed earlier and their success seems well deserved. If only they would reinstate the missing apostrophe in their name, I could thoroughly recommend a visit.